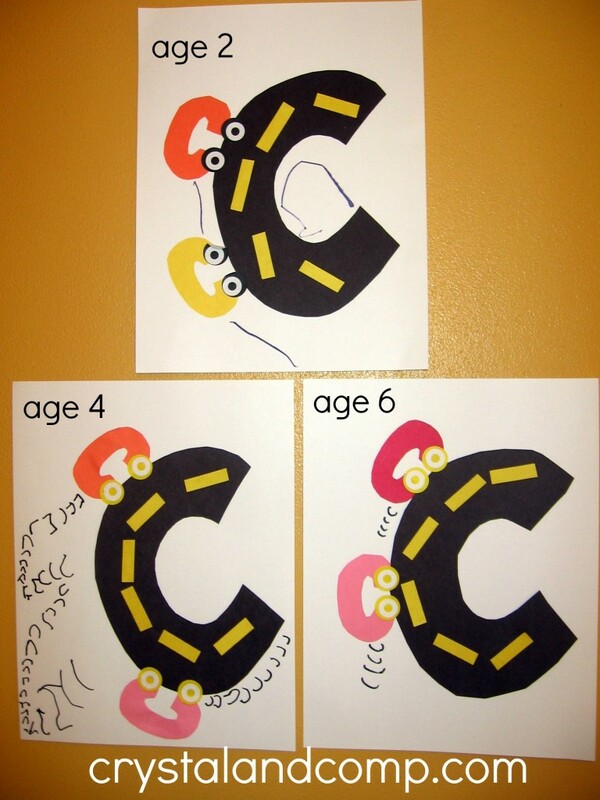 Letter of the week crafts for preschoolers is a super fun way to teach your little one the alphabet at home. 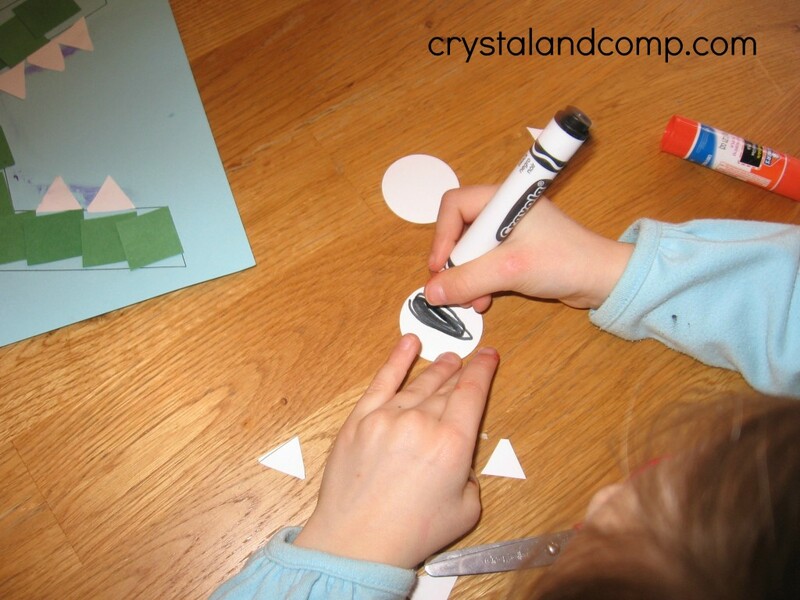 If you’re doing preschool at home, these ideas are easy for anyone to create with their preschooler and create memories that will last forever! 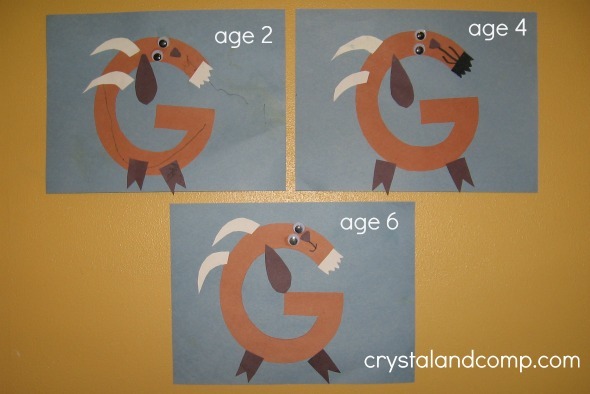 Let me show you how easy it is to make this g is for goat. First, let’s gather up the supplies you will need. We also give you a template to use. 1. 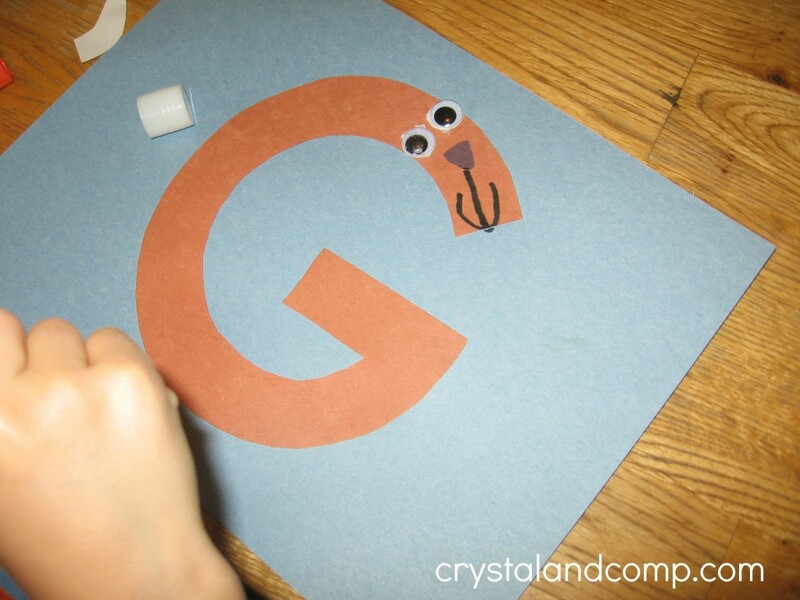 Flip the G over and apply glue to the back. 2. 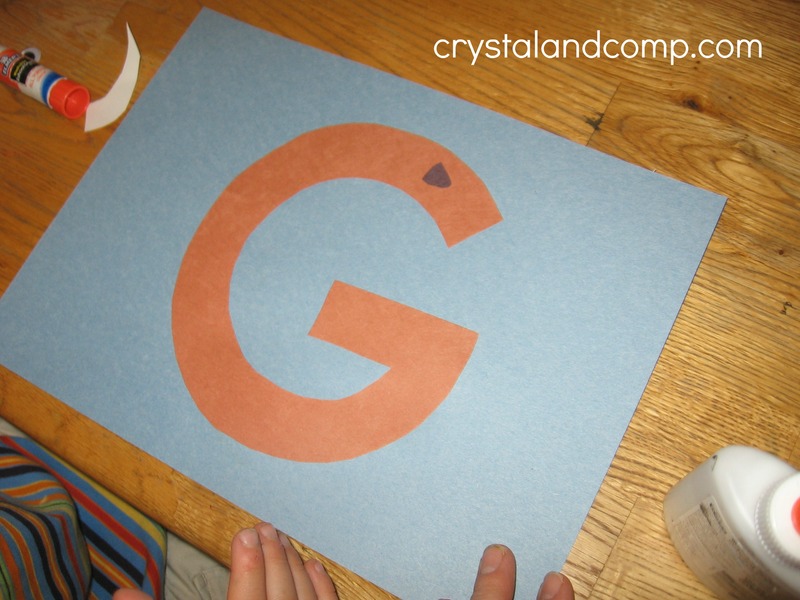 Glue the G to the center of the paper so that there is space above and below it. 3. Glue on the nose. Be sure to leave space below it for the mouth. 4. 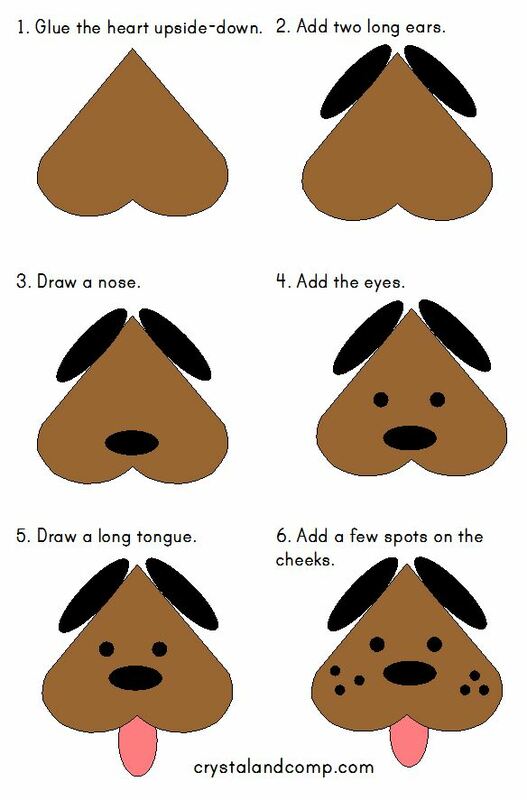 With the black marker, draw a long line from the nose and add a smile. 6. Attach the goat’s horns. 7. Now add the ear. 8. 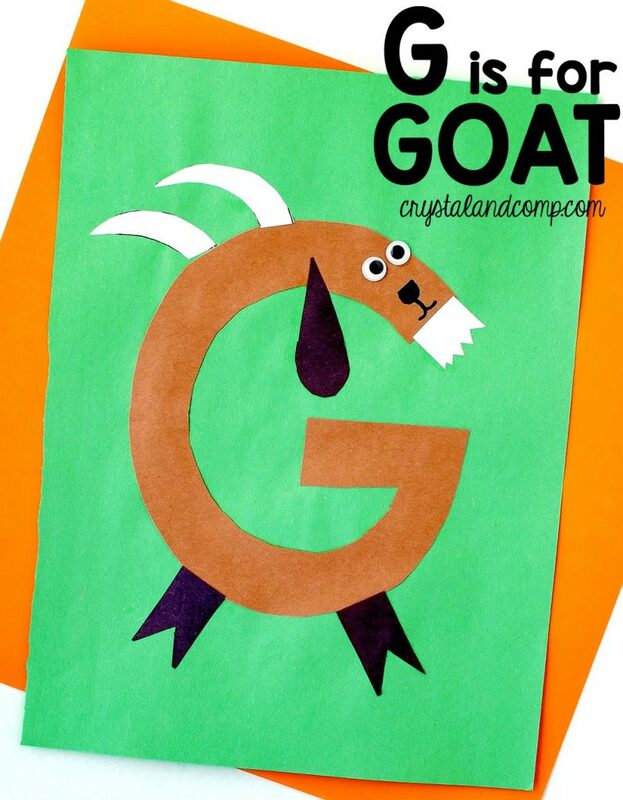 Finally, give the goat some hooves. And here is what they look like by age of the artist. “Galumph!” went the little green frog one day. “Galumph!” went the little green frog. I just love when I find a book that fits in perfectly with the craft! 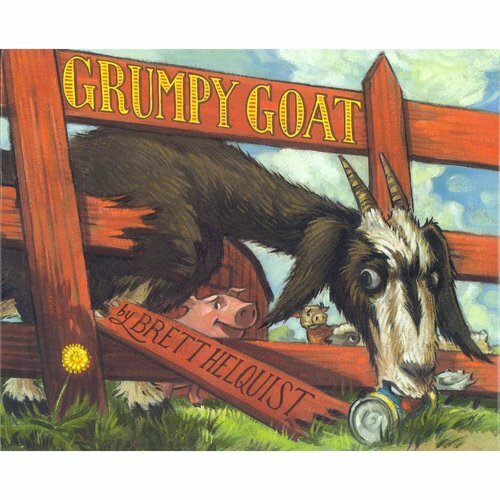 This is a new book (published 2013) about a friendly little farm with a new resident: a grumpy goat. Goat has never had friends and chases away any animals who try to get close to him. But one day he discovers a dandelion alone in the grass. He trims the grass, waters the flower, and begins to enjoy the company of the other animals. But one day the dandelion turns gray, and a breeze blows it away. Goat is devastated. Until… can you guess the ending? 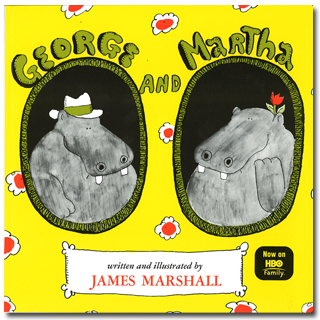 If you’ve never read the George and Martha hippo books, please reserve them from your library before you leave the computer! This series of books is the kind I’d read even if my kids weren’t around. The stories are funny, the chapters short and the pictures hilarious. Highly recommended! We love James Marshall’s versions of the classic fairy tales. 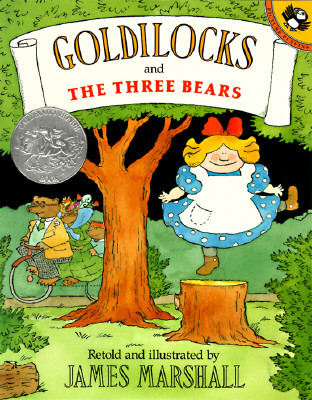 Here’s a line: “To tell the truth, Goldilocks was one of those naughty little girls who do whatever they please.” Marshall’s one-of-a-kind illustrations and lines like this one make the fairy tale seem new. My kids ask for it again and again. 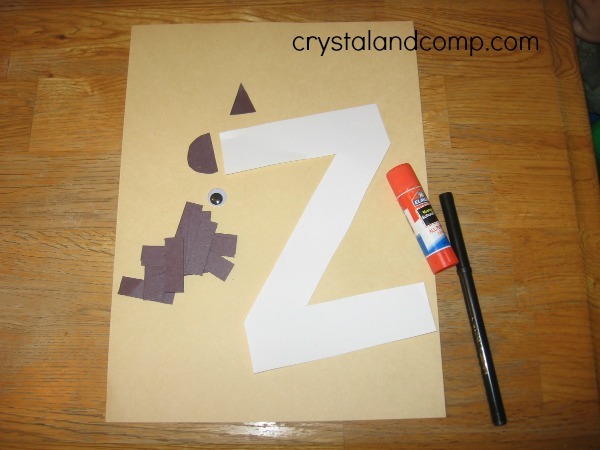 Want to download all 26 letter crafts, instructions, templates and supply lists at once? You can do that here. 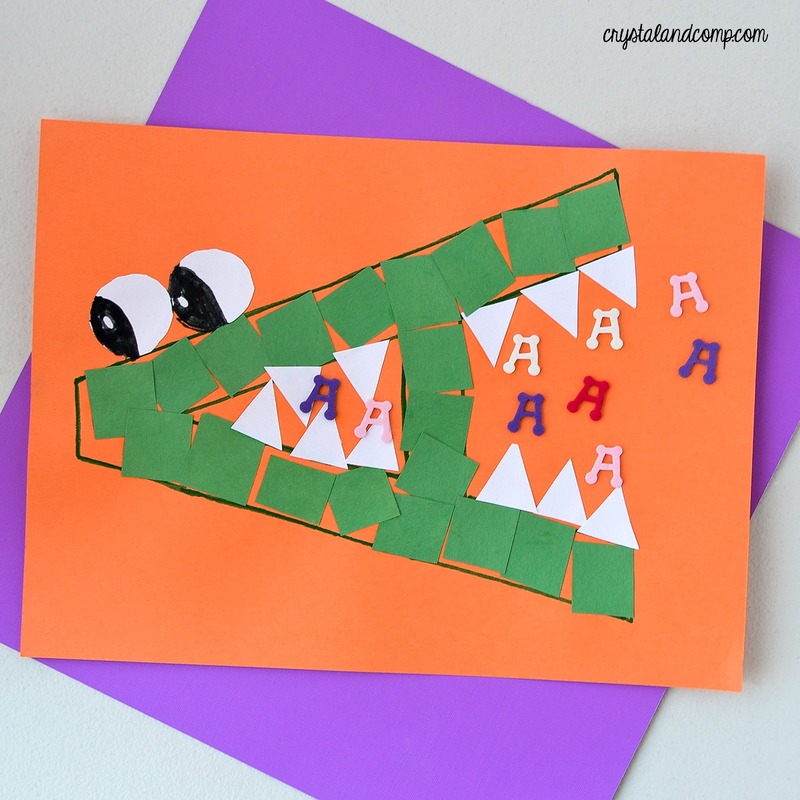 Want more letter of the week crafts? 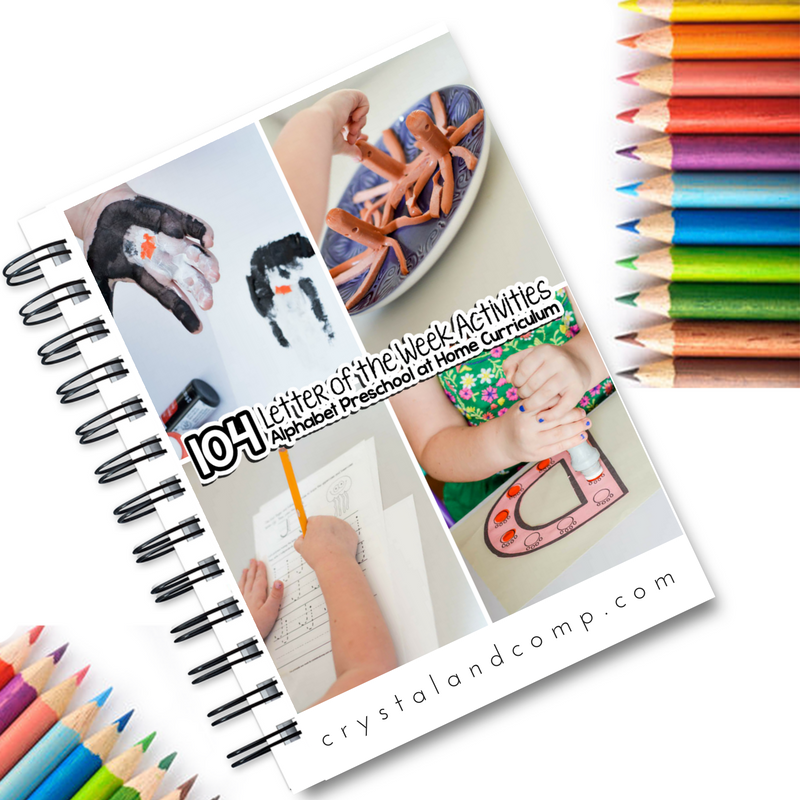 We have 104 activities you can download which include crafts, recipes, handprint art and worksheets for every letter of the alphabet. Grab it here. 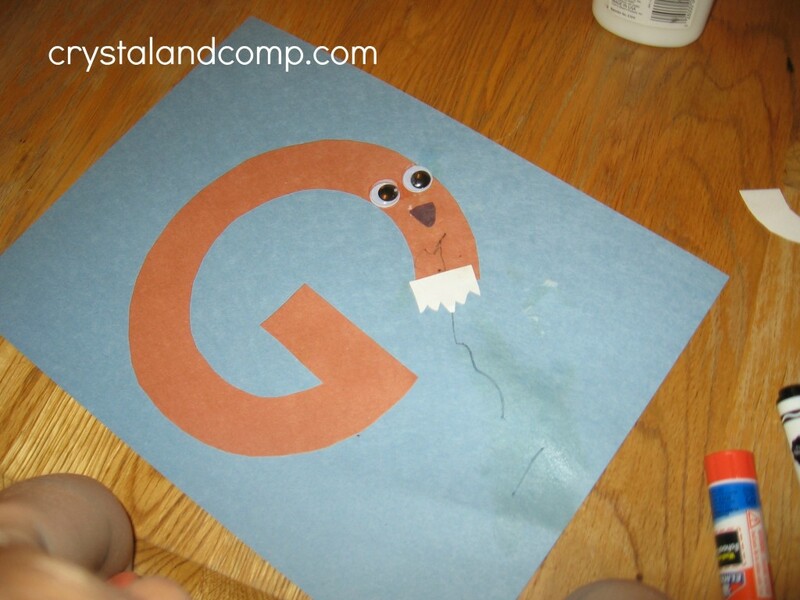 Are you teaching your little one his ABC’s? 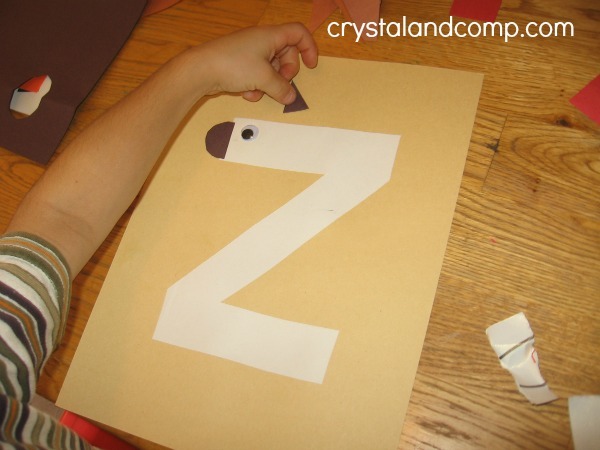 We have a super fun way to make learning the alphabet hands on. 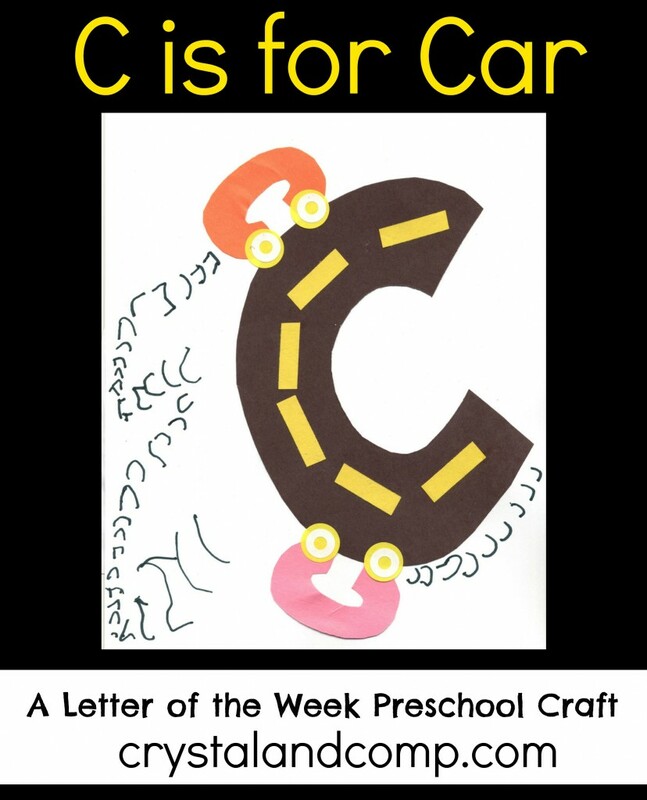 Check out our letter of the week crafts for preschoolers. 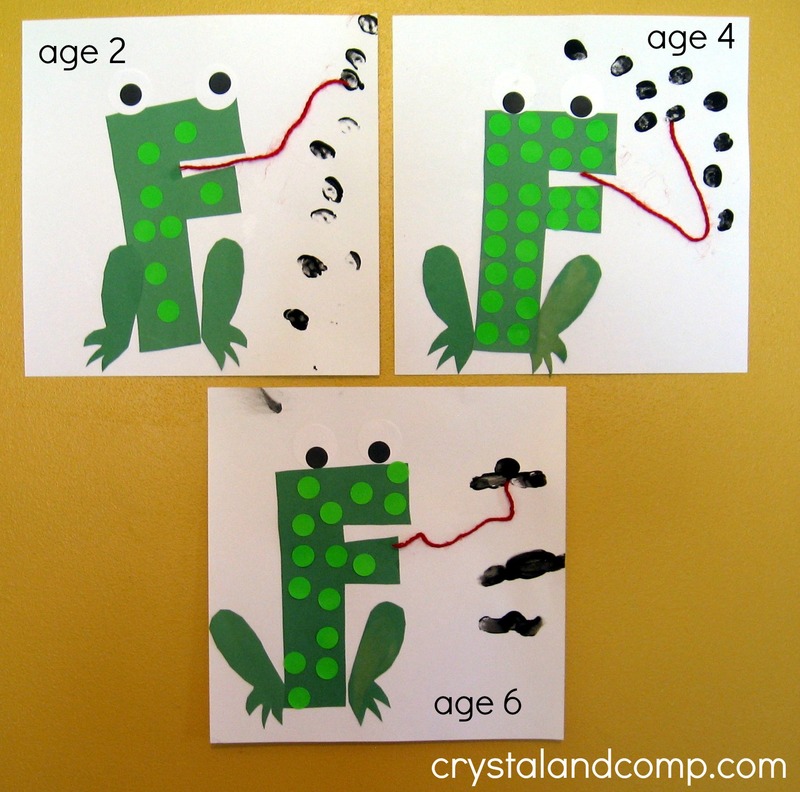 We’re going to show you how easy it is to make an f is for frog craft using our easy to follow template. 1. 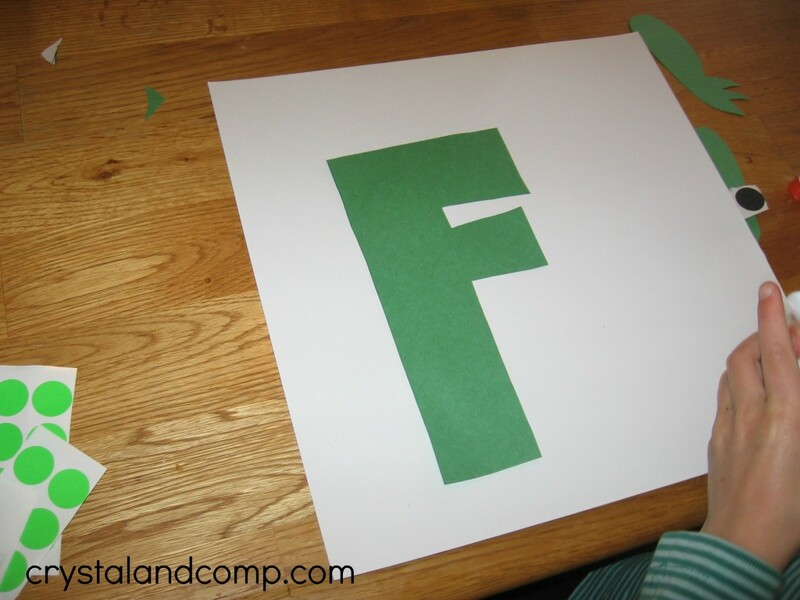 Glue the F to the paper. Make sure it is off-center toward the left. 3. 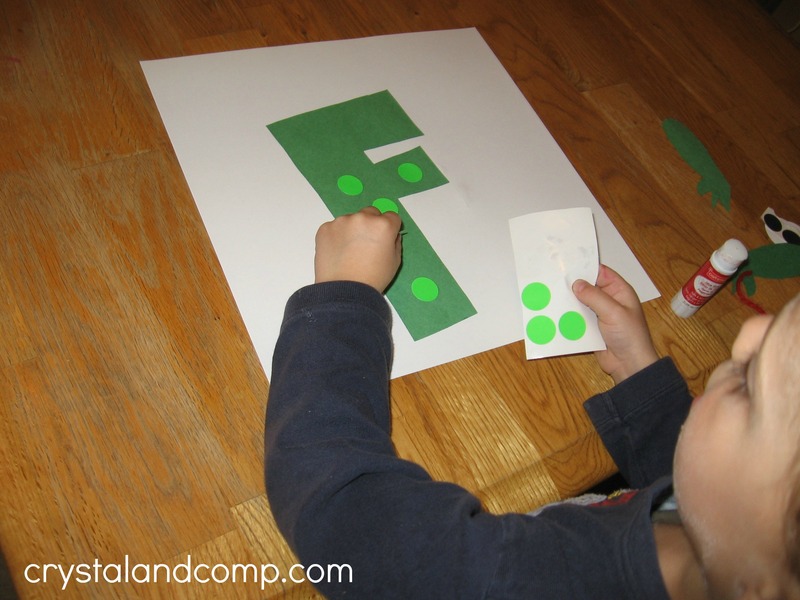 Add the black stickers (or glue the black circles) to the larger white circles and attach them to the top of the F.
4. Attach the frog legs. 5. 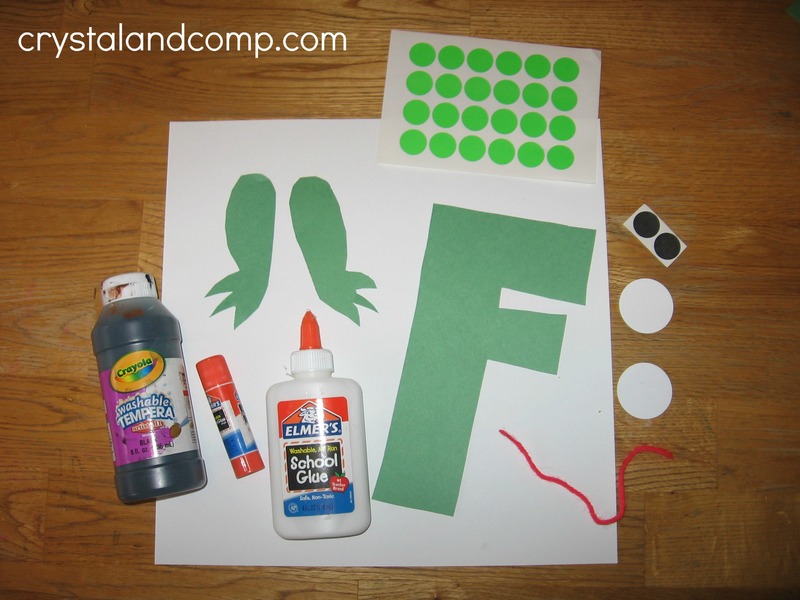 Use the school glue to make a stream of glue on the paper, coming from or near the open space at the top of the F. Carefully press down the red yarn for the frog’s tongue. 6. Dip your thumb in the black paint and make dots for the flies. His tongue is oh so long. And then he sings this song. His tongue is oh so long! I’m a little firefighter on the go. This is a fun story with adorably goofy pictures. Rabbit lives by himself and has things just the way he likes it: no fuss and no clutter. Each evening, he reads quietly by the fire. Until Froggie shows up. 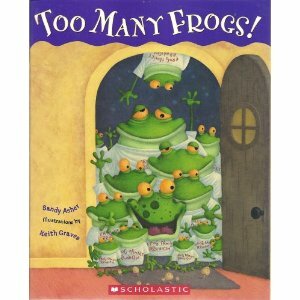 Each night he returns to hear the story — making himself a snack, piling up the pillows – and then showing up with his entire frog family. It’s all just too much fuss and clutter for Rabbit. But when he turns Froggie away, he finds that he misses having someone to listen. At the end of the story he embraces this different way of life. We loved this one! If you haven’t read this book, please get it from your library as soon as you can – it’s too great to miss! More than anything else, Cynthia wants a pony for her birthday. She’s so sure she’ll get it that she’s picked out the name: Marigold. 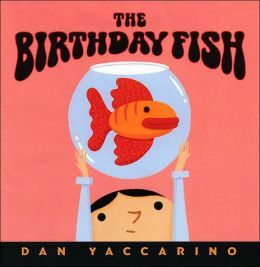 But on her birthday she gets a terribly disappointing gift instead… a goldfish. She is about to dump the gift down the drain, when it speaks up and promises to grant her a wish if she brings it to the lake instead. Over the long walk to the lake the two become friends. And as they turn around for home, Cynthia gives the fish a name – can you guess what it is? Do you have a preschooler who’s crazy about firefighters? This is one of our favorites, written by a volunteer firefighter. 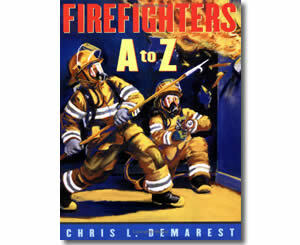 He takes you through a day in a firefighter’s life from A to Z. This action-filled story features bright letters to begin each page. 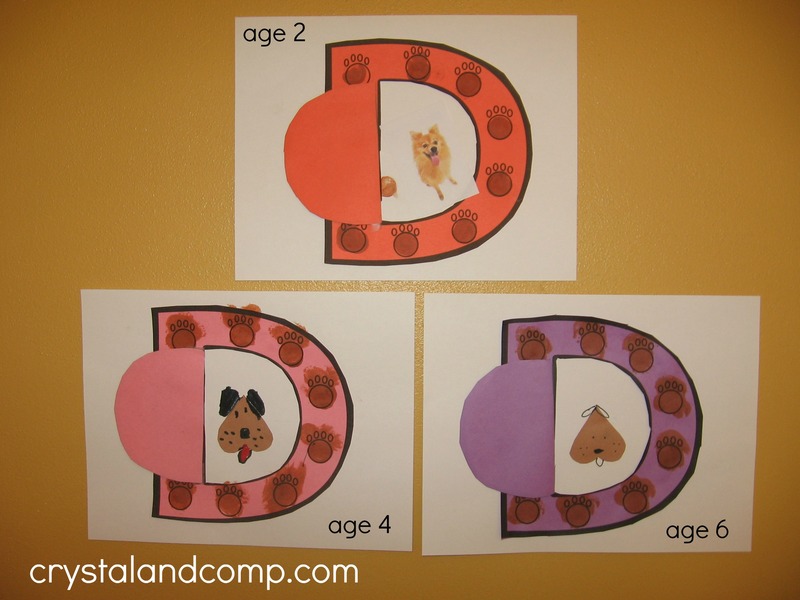 Your preschooler may enjoy naming them as you turn the page. 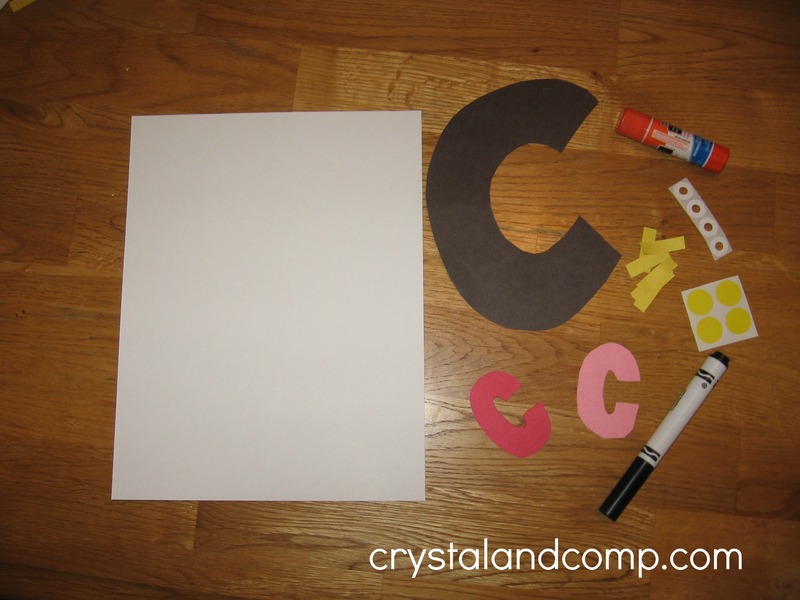 Want to download all 26 letter crafts, instructions, templates and supply lists? You can do that here. 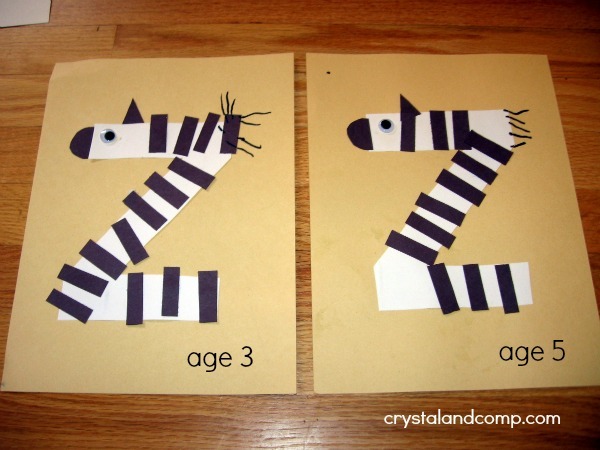 Do you have a preschooler who is learning his alphabet? 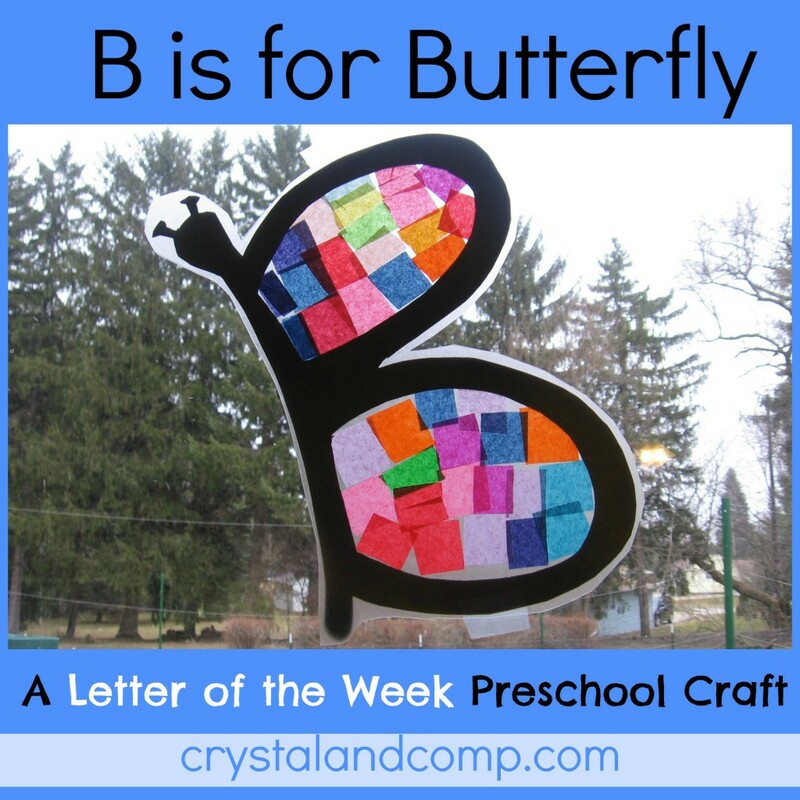 We love doing letter of the week crafts for preschoolers. And this craft does not disappoint! 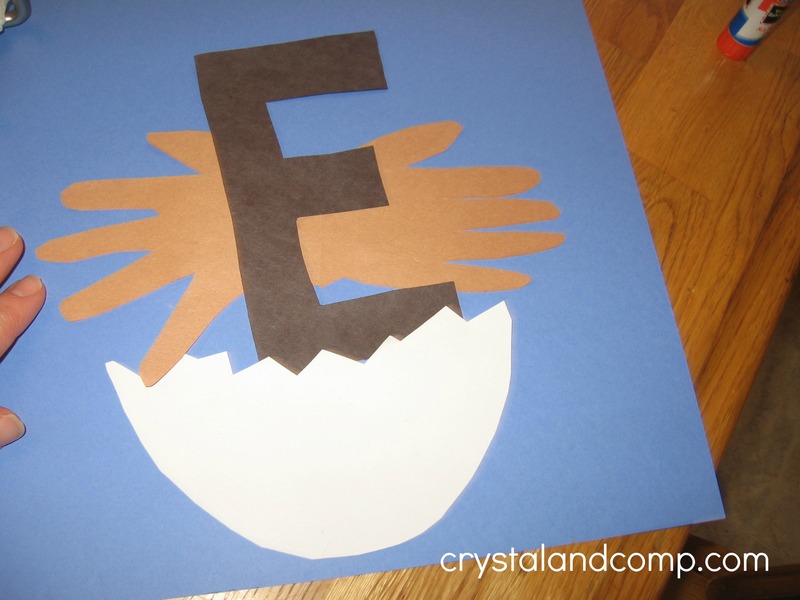 Let me show you how easy it is to make this E is for eagle alphabet craft with your preschooler. Let me show you just how easy this is to make. I love that it is perfect for many preschool ages. You can assist kids as young as two years old and these are great for all the way up to Kindergarten. 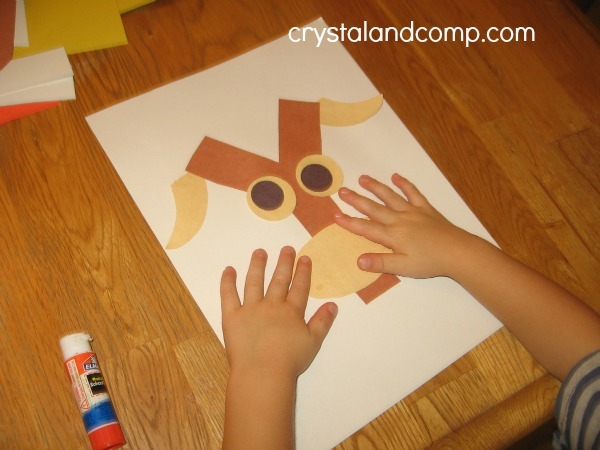 This craft is also great for building motor skills…. as you read on you will see what I mean. 1. 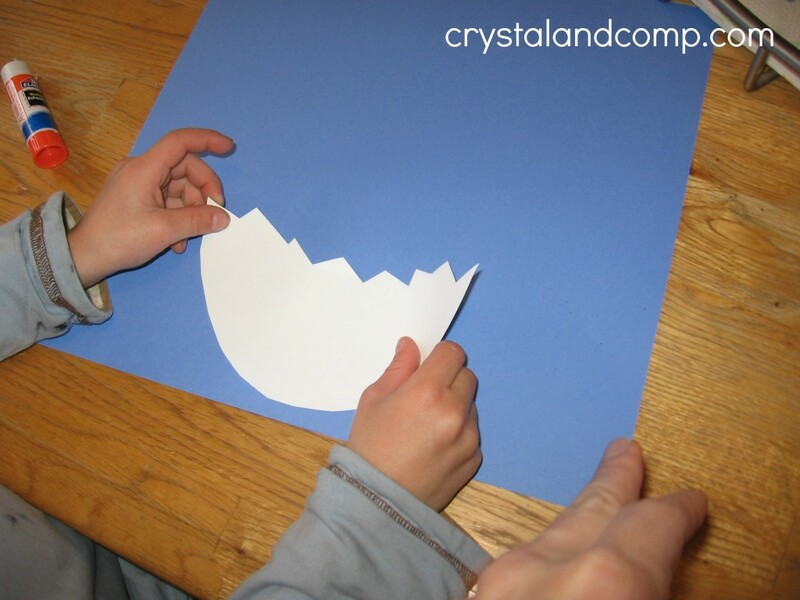 Attach the paper egg shell to the bottom of the paper using a glue stick. 3. Add the black letter E to the top of the handprints. 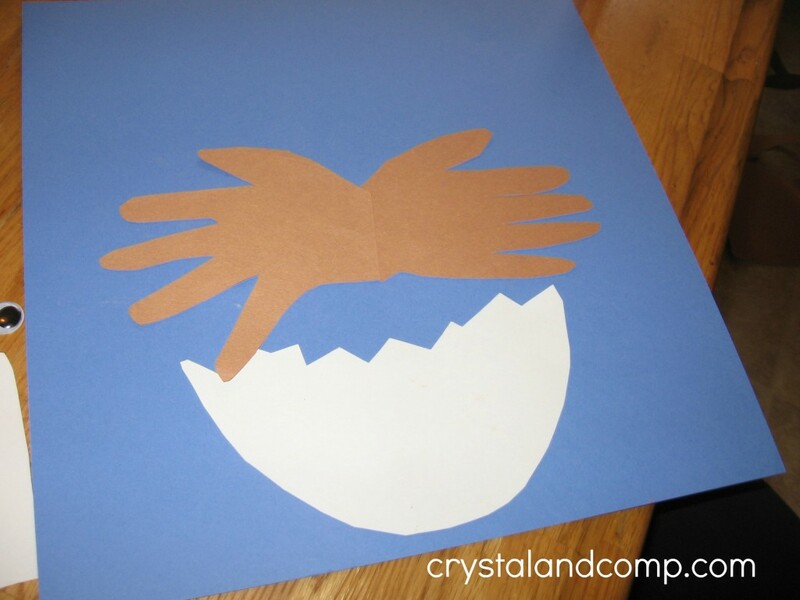 Try to tuck it underneath the top of the egg shell. 4. 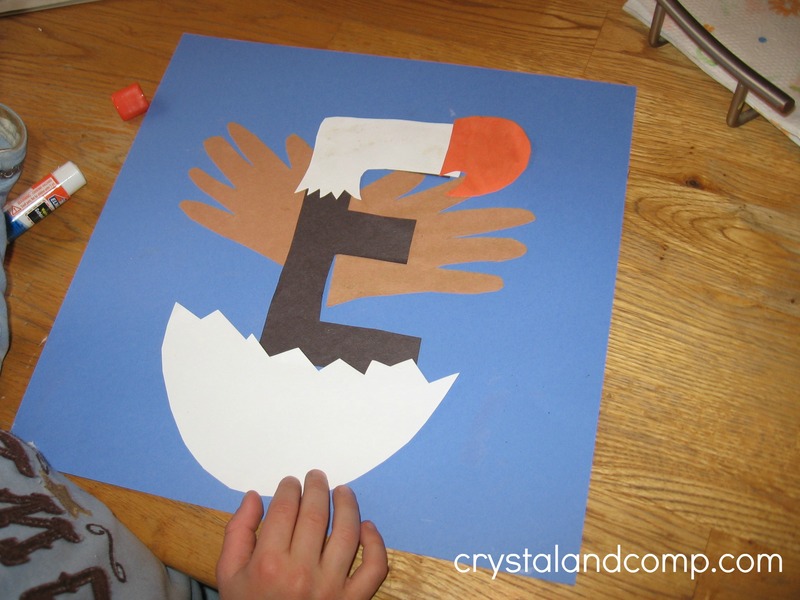 Add the white head to the top of the “E” so that it starts to look like an eagle. 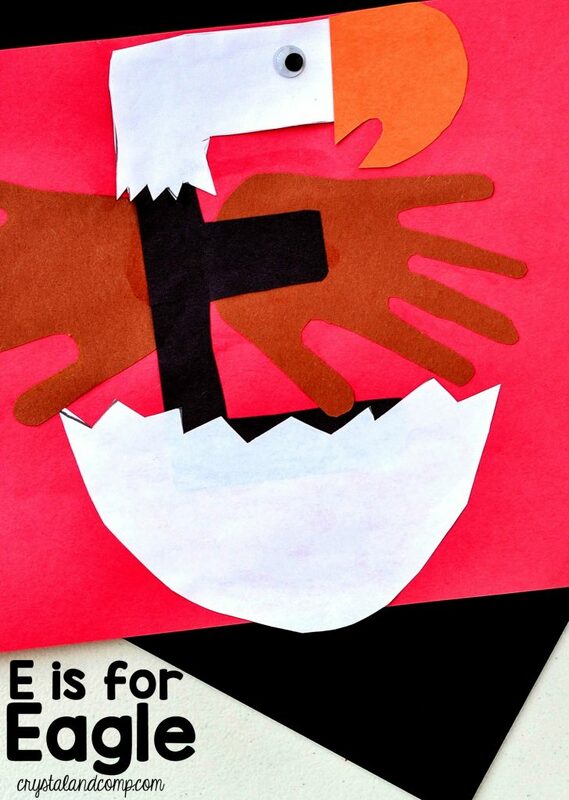 By the way, baby eagles are all brown — and if scientific accuracy is important to you, make this brown. I decided I wanted my kids to know it was an eagle, which they would not have known had I not made it look like an adult. 5. 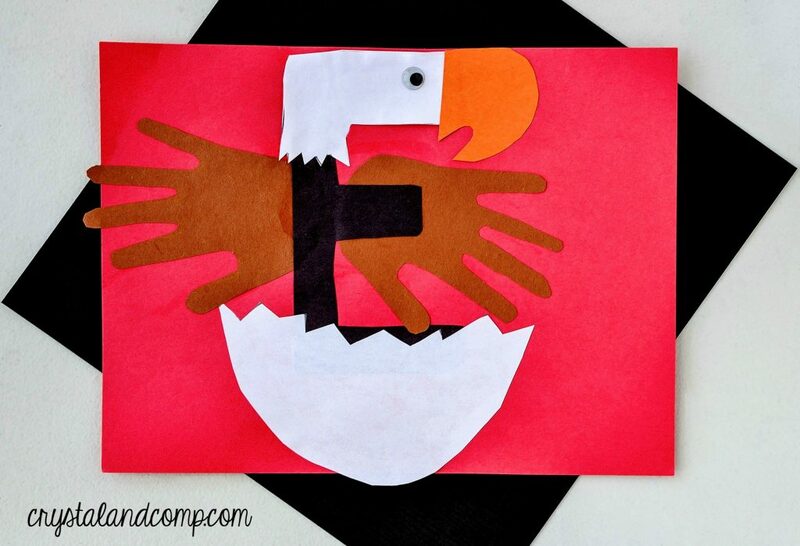 Add the eagle’s beak. 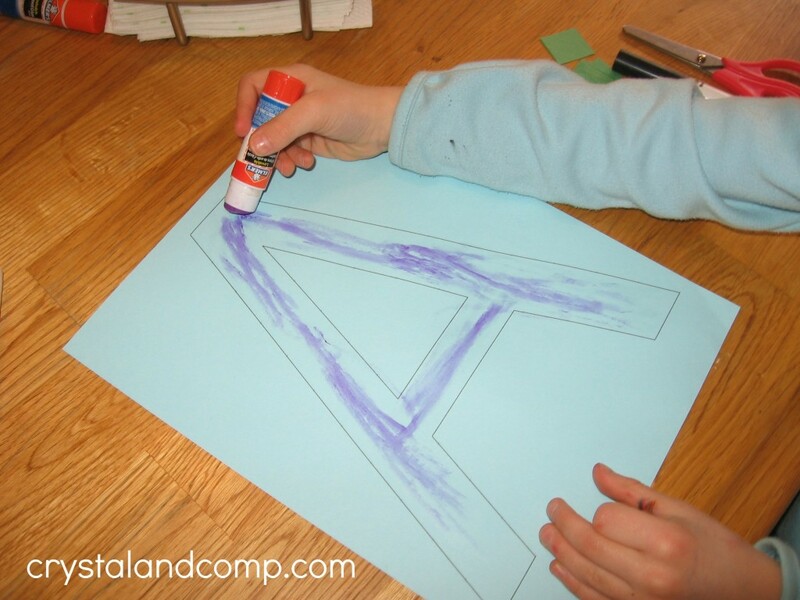 Remember to lay it out first and then flip it over to put glue on the back. 6. 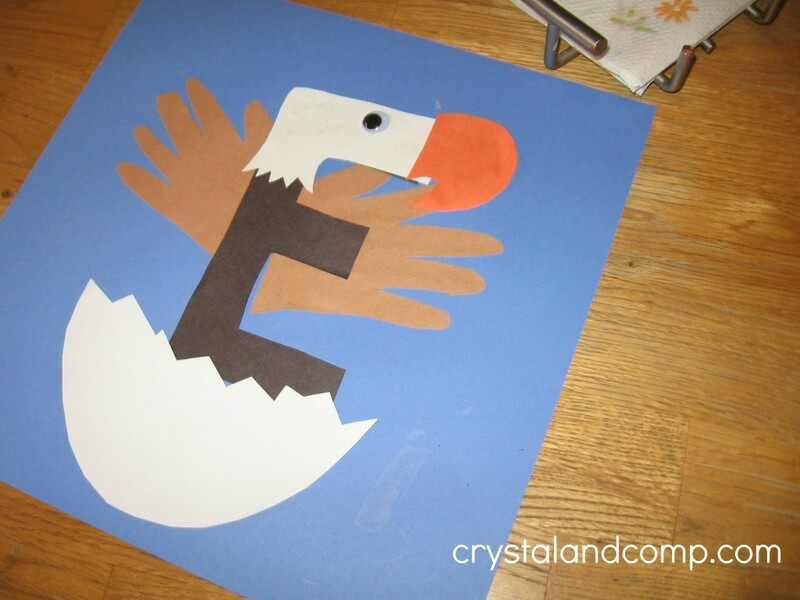 Use the tacky glue to attach the eagle’s eye. 7. Here’s the really fun part! 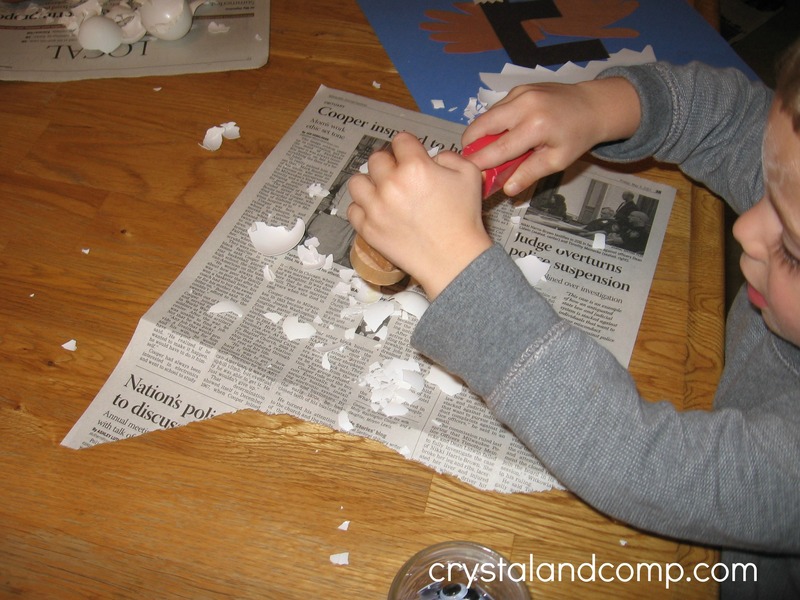 Smash the egg shells with a toy hammer. 7. Apply tacky glue all over the egg shell. 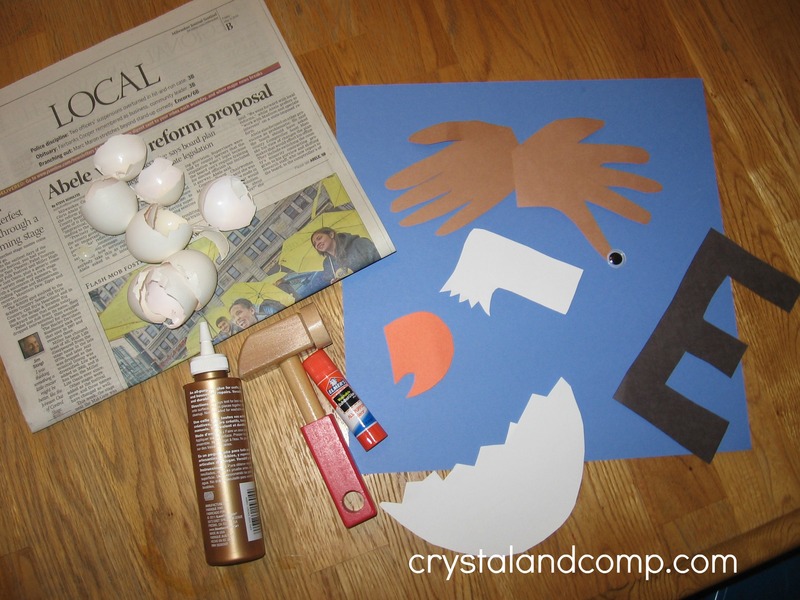 Then attach broken egg shell pieces. Here are some finished projects based on skill level. And, if you don’t want to do the egg shells you can skip that part. It’s still super cute. Up on a spider’s web one day. That she called for another elephant to come. 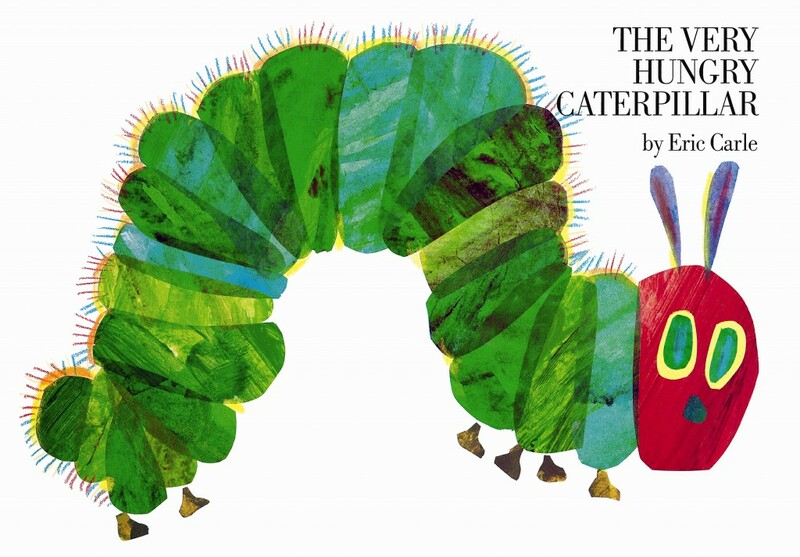 This was one of my favorite books from childhood, and I still think it’s adorable. Grandma Tildy does not want a pet, but agrees to buy one from the pet salesman every time he visits. 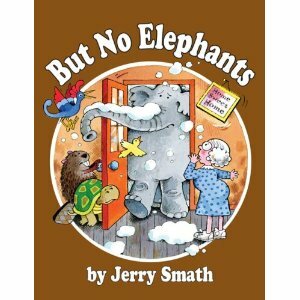 “But no elephants!” When winter hits the salesman leaves his elephant by her door — when she finally relents and brings him inside, there’s a ton of trouble. But the kind elephant brings about a happy ending. Edward is tired of being an emu. Every day he finds a new animal cage and pretends to be that animal. After sharing a cage with a seal, lion, and snake. Edward returns to his own cage – only to discover a new emu has taken residence there. “Hello, I’m Edwina! It’s nice meeting you. You’re the best thing I’ve seen since I came to the zoo!” The funny pictures and catchy rhymes make this a wonderful story. 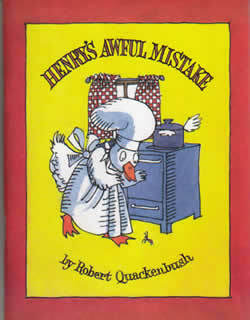 This creator of the popular Max and Ruby books has countless other gems, and Edward is one of them. In this book he plays at a friend’s house but must stay overnight when a snowstorm comes. Poor Edward is too sad to play. He won’t eat, and he can’t sleep. In this book and its companions, Edward Unready for School and Edward in Deep Water, we learn that not everyone is ready for the same things at the same time. 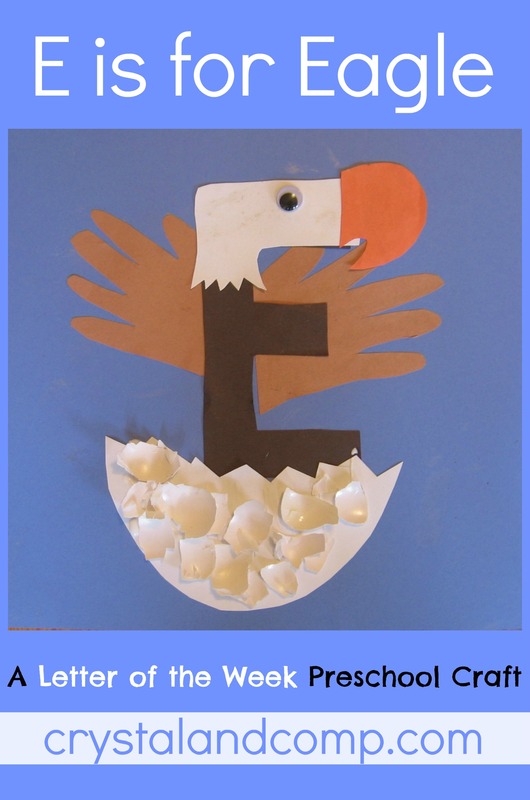 For more preschool resources for the letter E, visit this page. 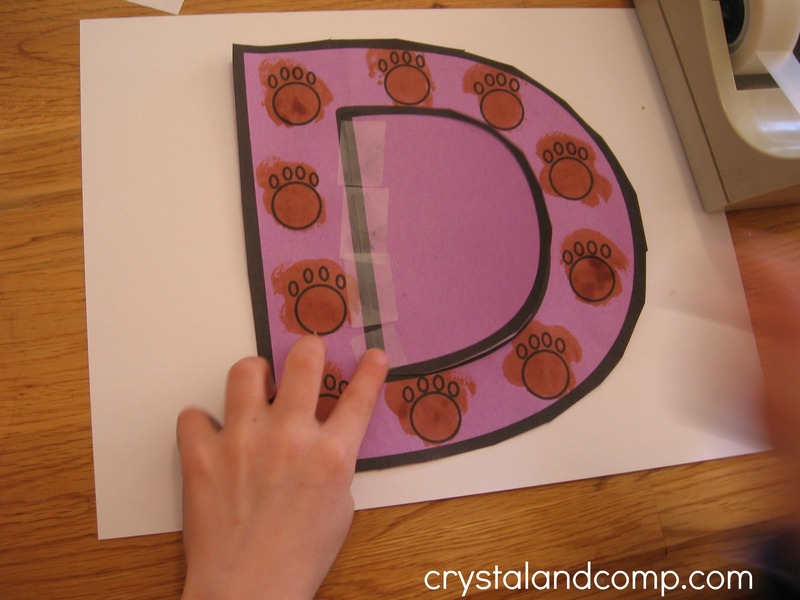 Are you working on the letter D with your young learner? 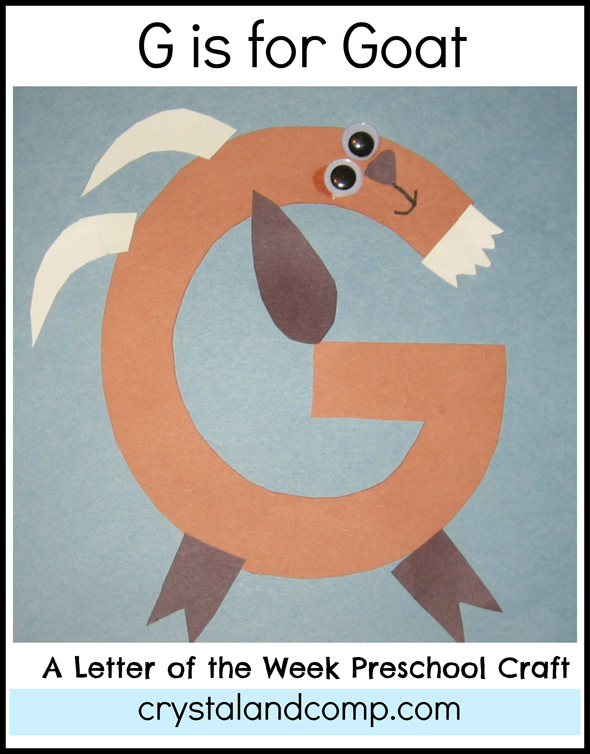 We love letter of the week crafts around here! 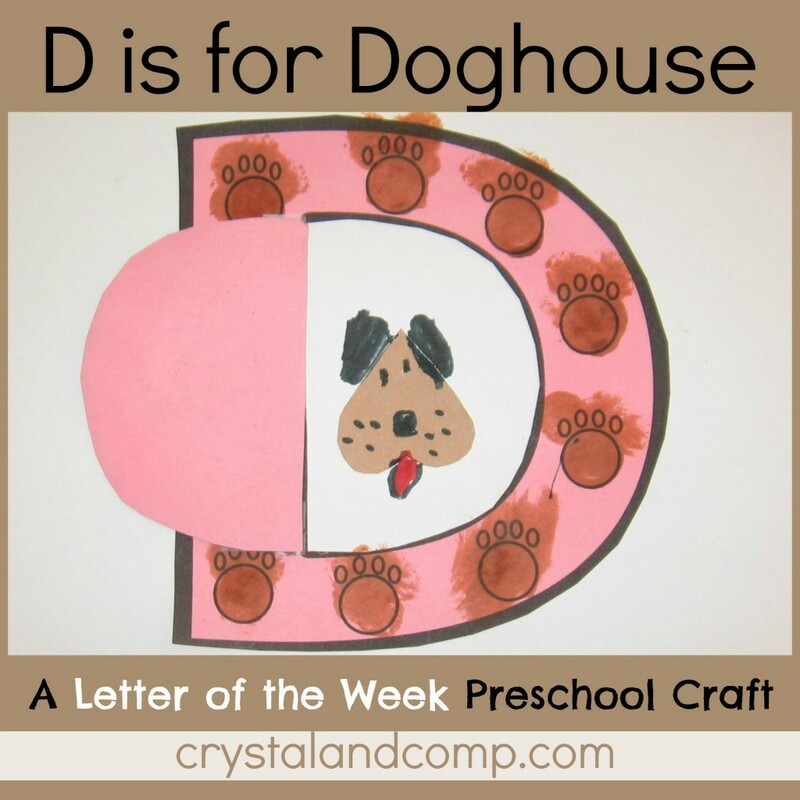 You will adore this d is for doghouse craft! 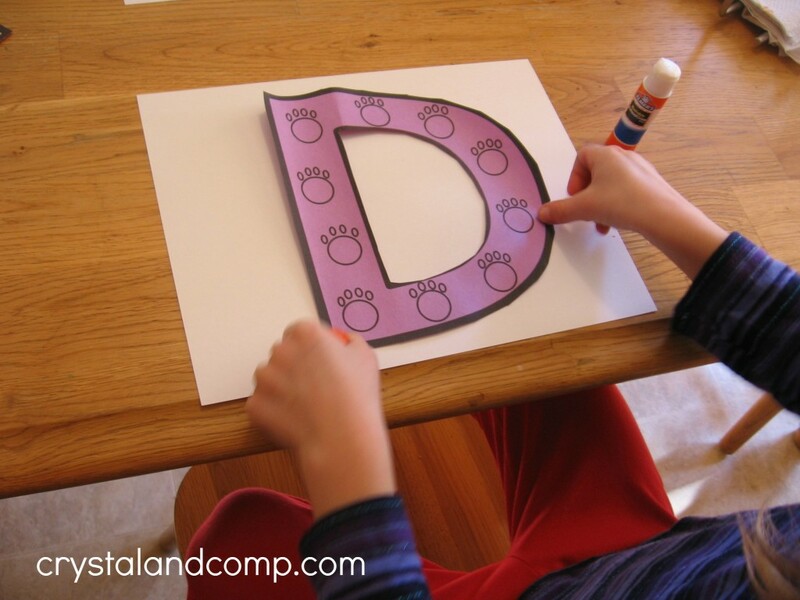 I like this craft because it reinforces the “D” sound a number of ways: Along the letter the kids made dots. Inside the doghouse is a picture of a dog. A door covers it. 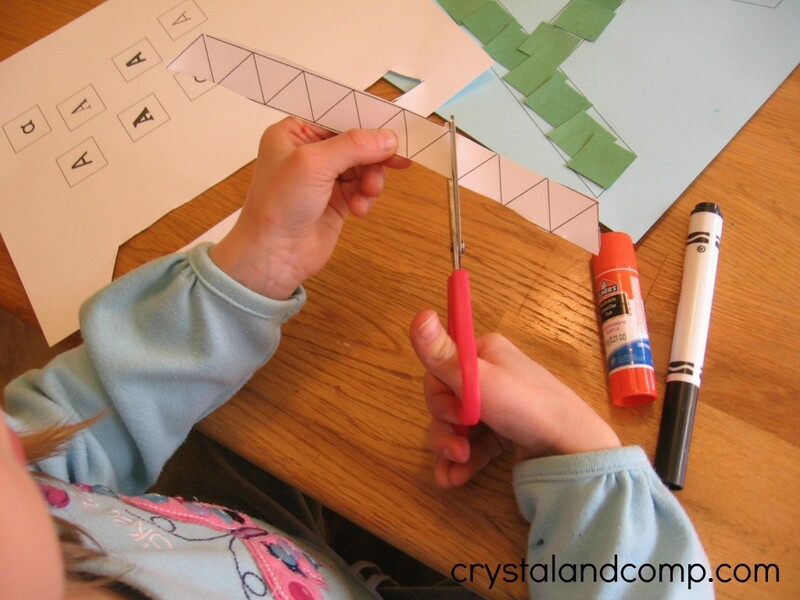 Your kids will like it because the opening door makes it an interactive craft that they could have fun with even after they are done creating it. Let me show you how easy this is to make. Here is everything you will need. 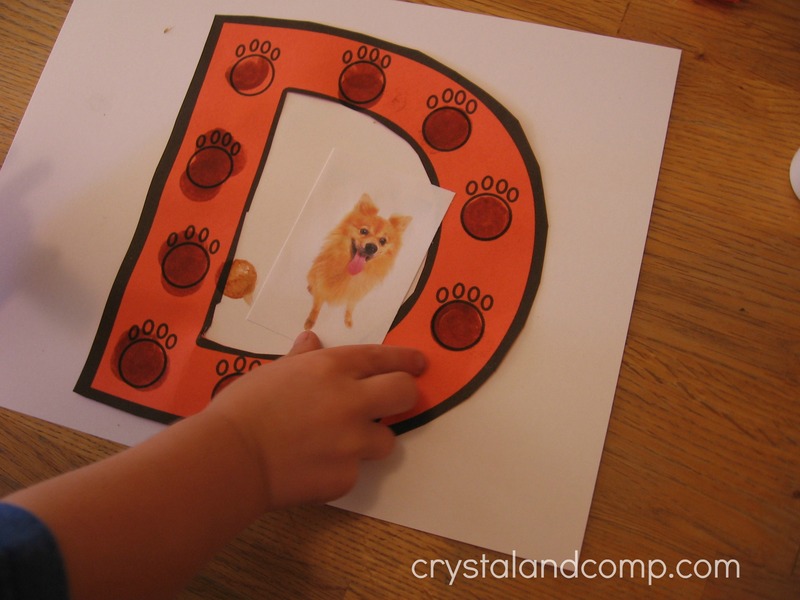 the inside of the letter D – don’t throw it away! 1. 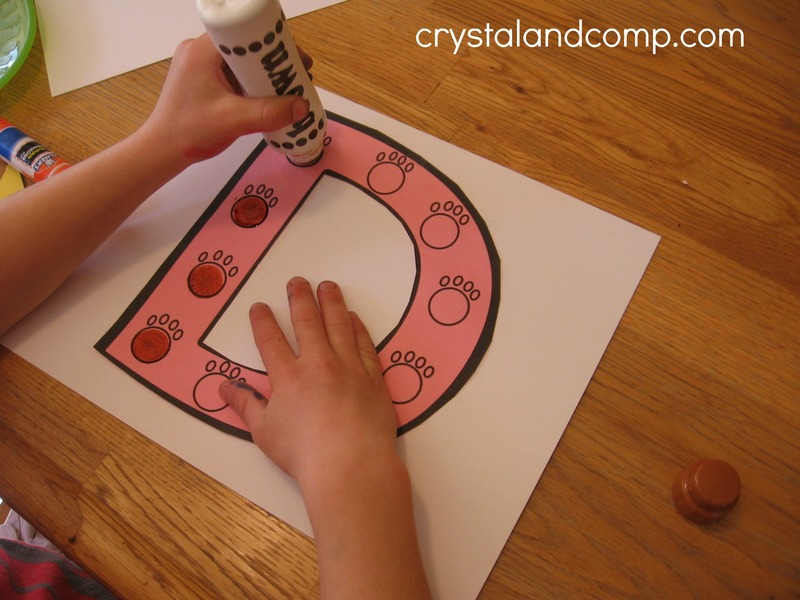 Glue the letter D onto the center of your piece of white paper. 2. 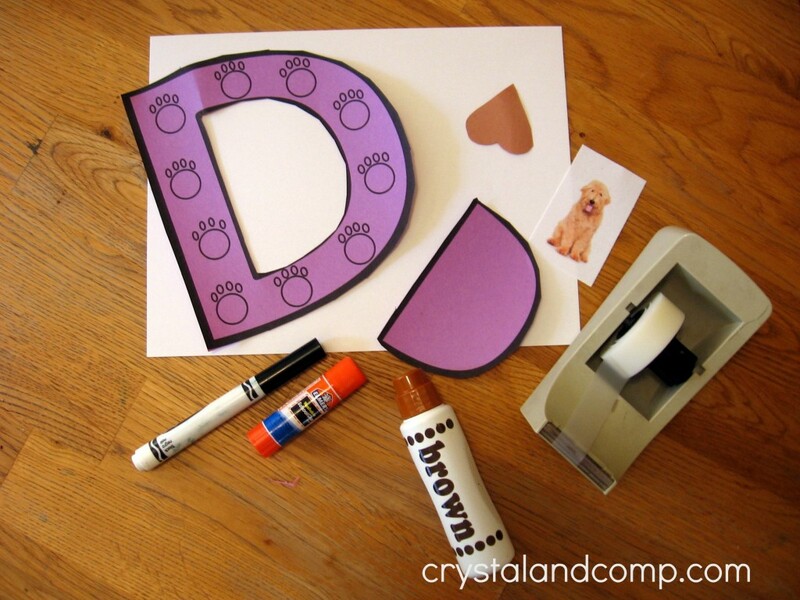 Use your Do-a-Dot marker to fill in the dog footprints along the D. If you’re not familiar with Do-a-Dot markers, you can get them at your local craft store or online. 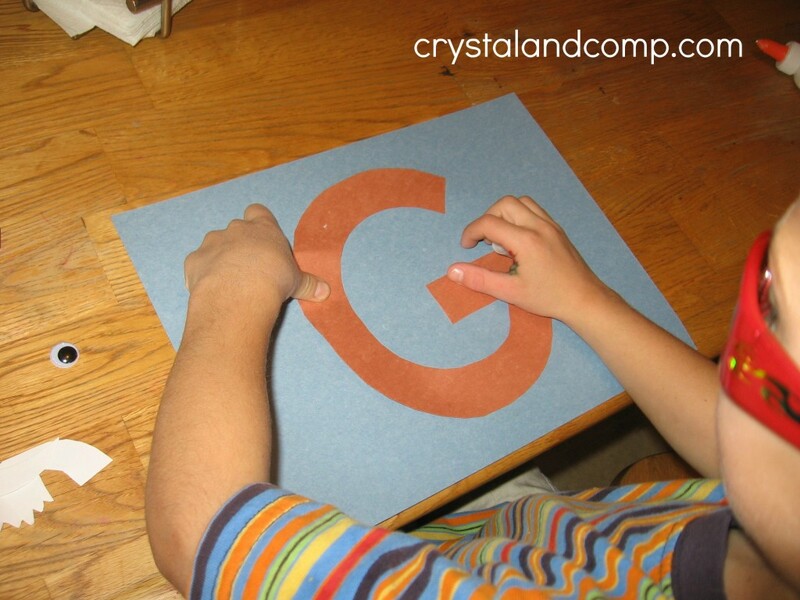 Using them in this way gives your preschooler some great fine motor practice. 3. 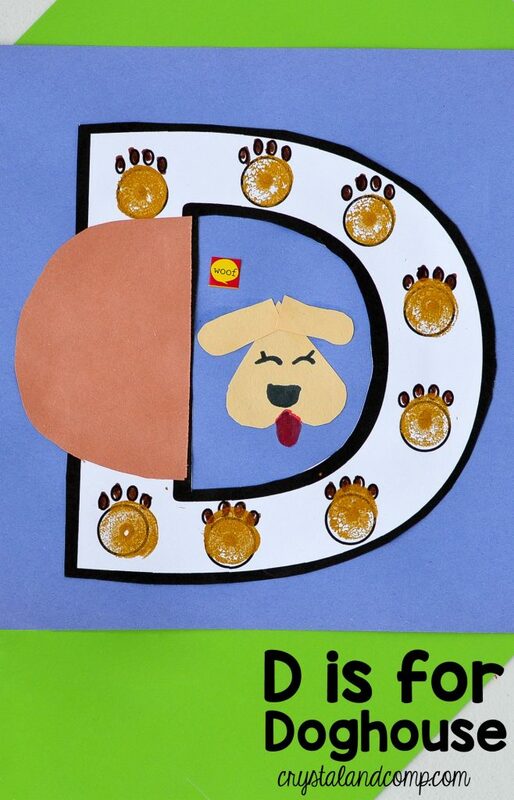 Glue down the dog picture from the printable — he’s in the letter D doghouse! OR, if your child is capable of simple drawing, follow the instructions below. 4. Your child will probably do best if you model this for him. Be as clear as you can. My daughter (just finishing kindergarten) was the guinea pig, and my instructions were not as clear as they were for her brother (age 4), as you might notice in the final pictures. 5. 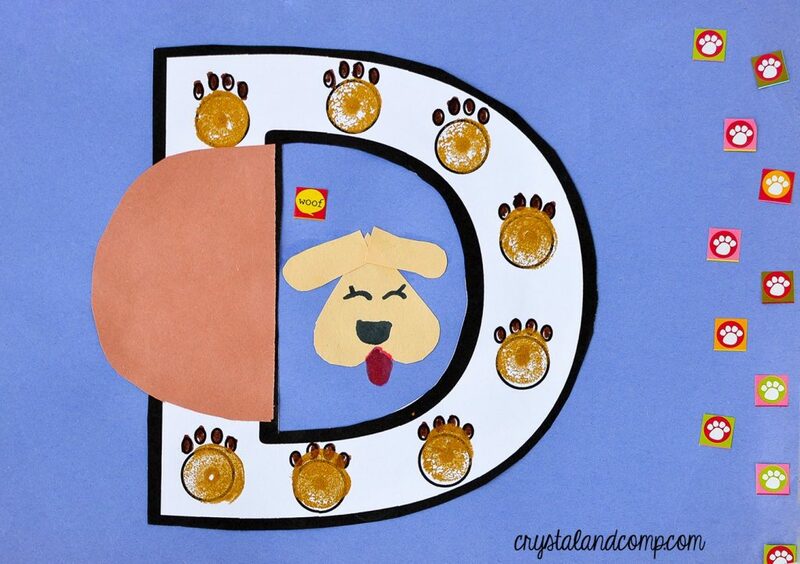 Tape the inside of the D over the picture so that it serves as a door. 6. Open the door to find the dog in the doghouse! 7. And here are our finished projects! 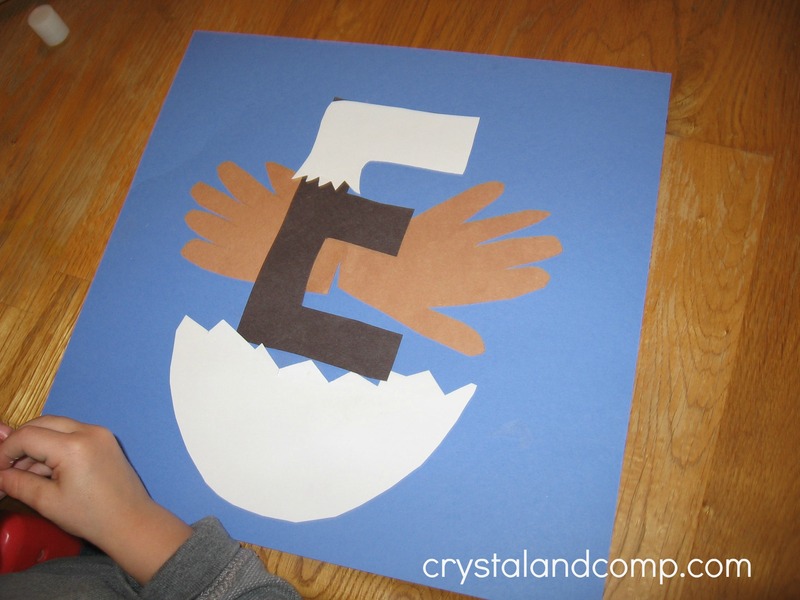 This was a simple craft, but my kids really had fun with it afterward. They all carried theirs around, opening and closing the doghouse doors to show anyone who was interested (and even those who weren’t :)). 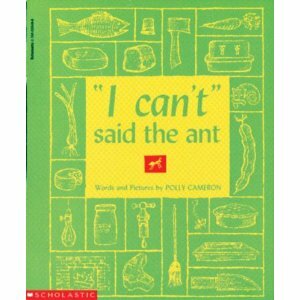 This classic story (1961) is still a favorite of kids today. The dogs in cars are all in a hurry — where are they going? At the end of the story they are having a giant dog party on the top of a tree. If you read this to your child enough, he’ll memorize it – and as he starts to read, it will be one of the first he can read by himself. 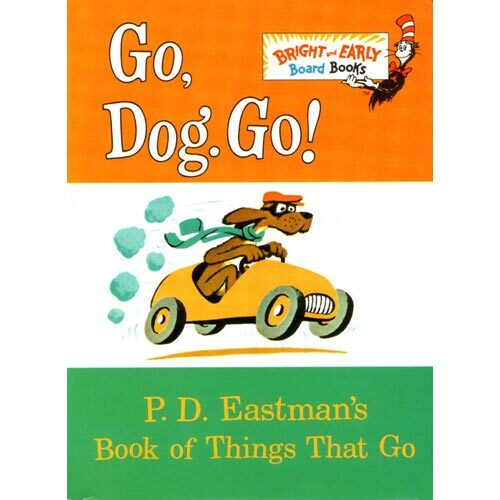 This is my two-year-old’s favorite book which he pleads for every time we drive by the library (he doesn’t know he’s getting it for his birthday next month!). 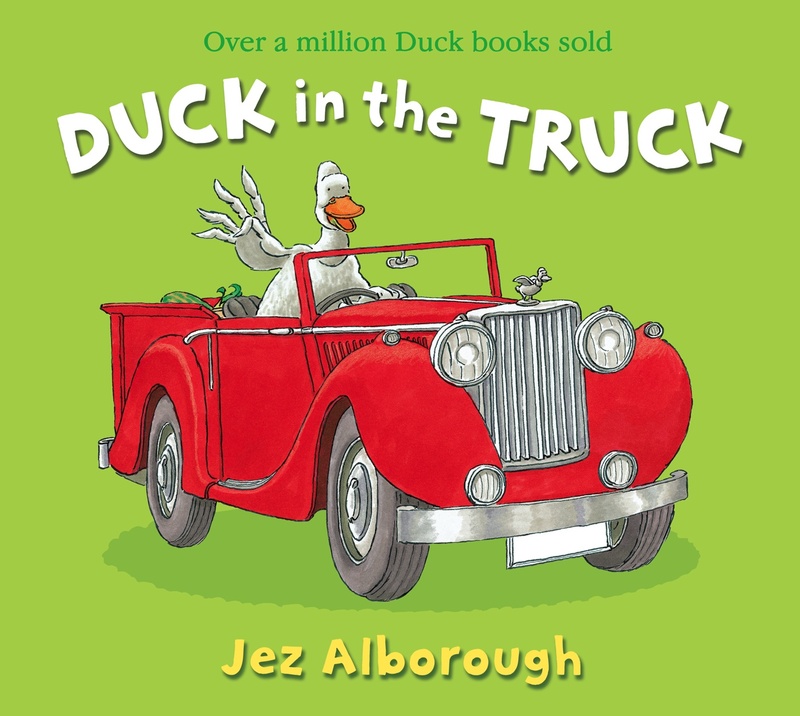 This is a rhyming story about a duck whose truck is stuck in the muck. All sorts of animals stop by to help him out. 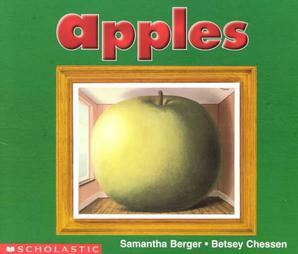 Rhyming books are so important for children. 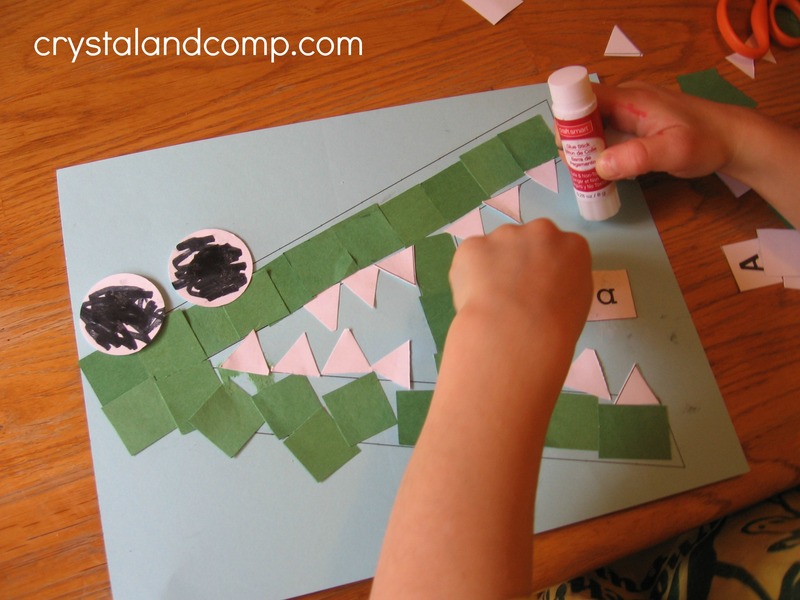 As your child gets to know a rhyming book, leave out the rhyming words and let him fill them in. If you’ve never read this book, you’re in for a treat. 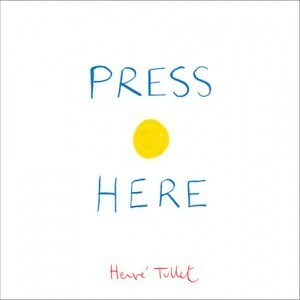 Each page instructs the reader to press a dot, turn the page, or shake the book — turn the page and the dots have changed! This is a unique book that makes for a wonderfully cozy read-aloud. Letter of the week crafts are an excellent way to offer your kids preschool and early education activities at home. 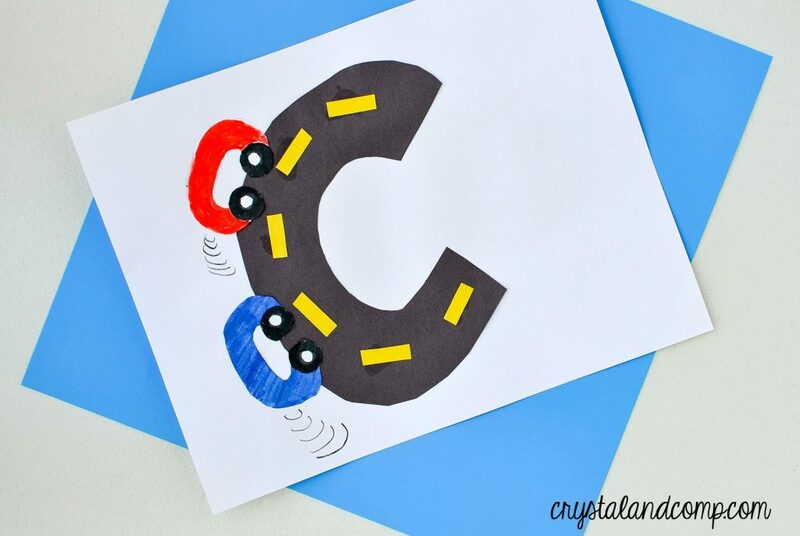 C is for car is a super fun way to bring this letter to life. 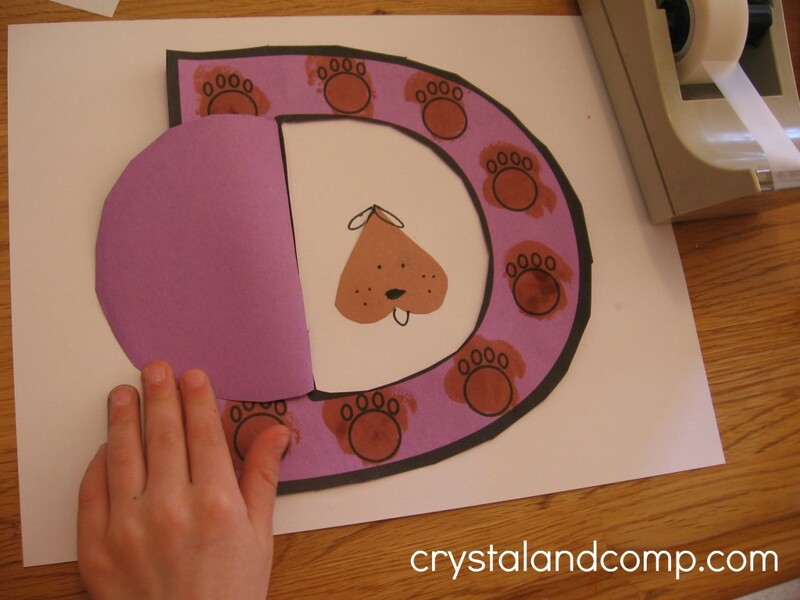 Introducing the letters one at a time is a great way to go through the alphabet with your your young learner. 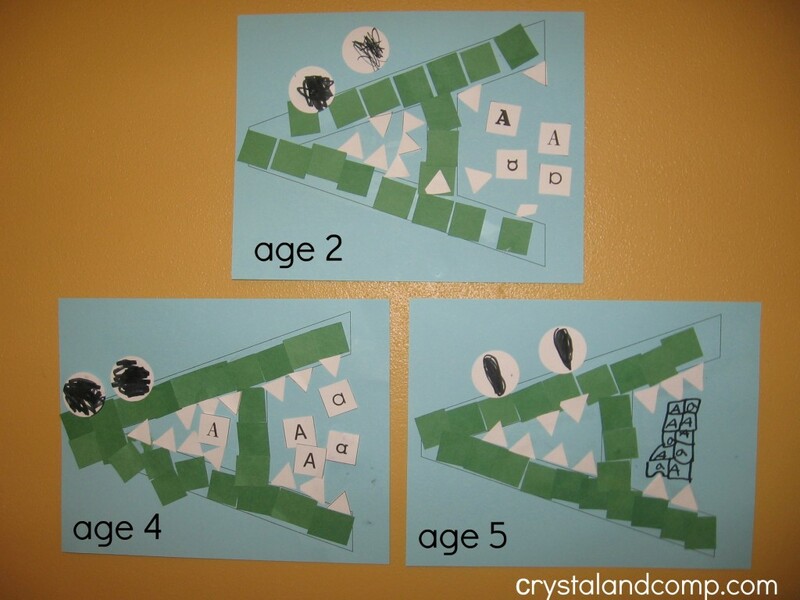 My kiddos have had so much fun doing these at different ages. This craft can be done with children ages 2 to 6 years old. I’ve learned that my boys love any craft that takes the shape of a vehicle. 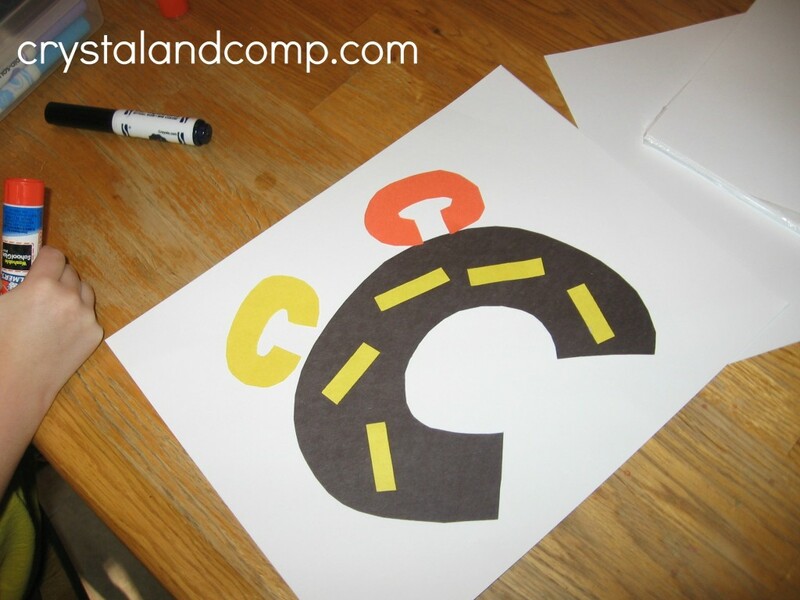 So it made sense to use a car craft to teach the shape and sound of letter C.
1. 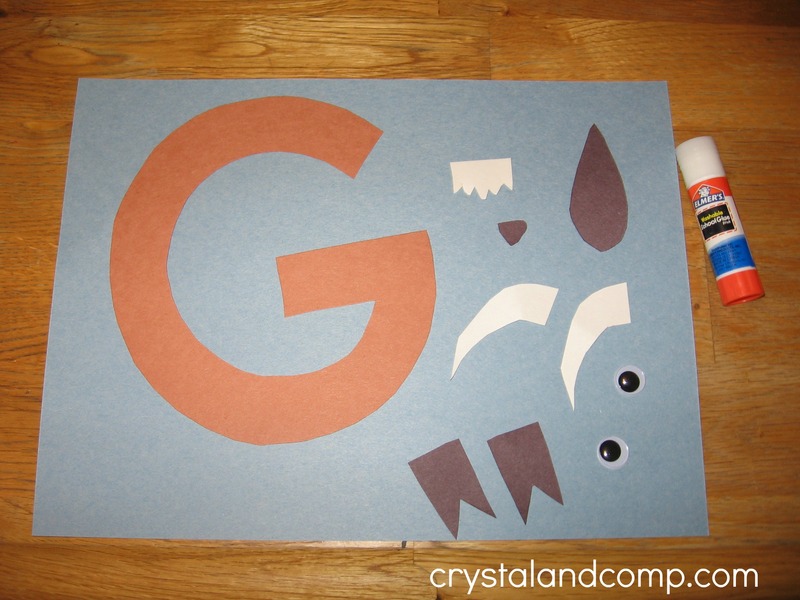 Glue down the large letter C.
2. Glue down the yellow strips to make your road. Younger preschoolers will need guidance with this. 3. 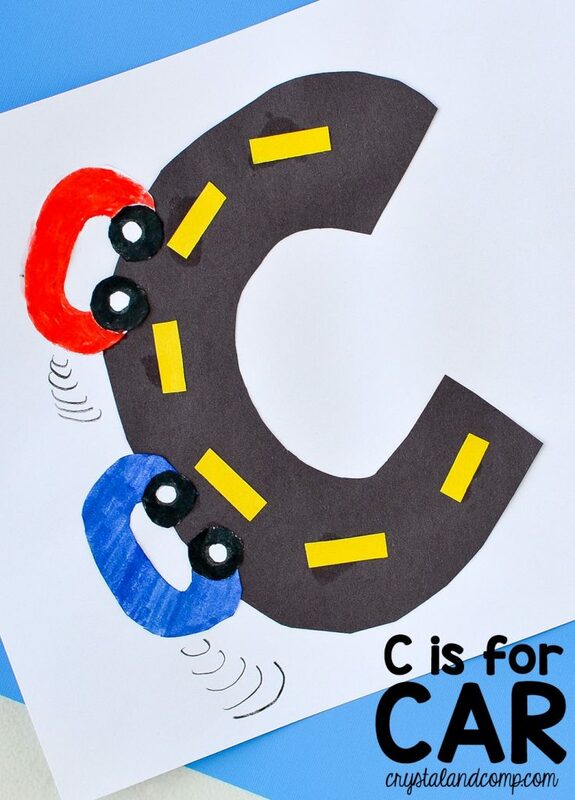 Now glue down the smaller C’s to make your cars. 4. 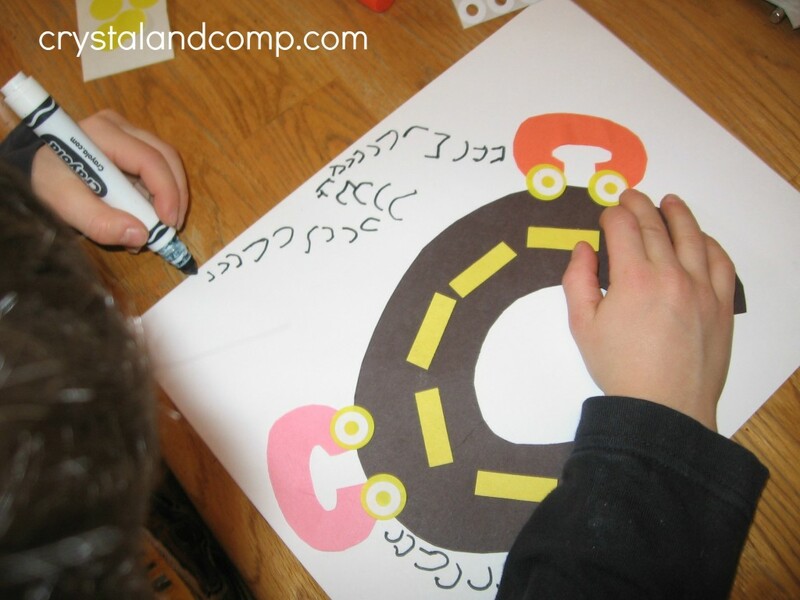 Next, glue down the tiny black circles or use round dot stickers to make the wheels of your cars. 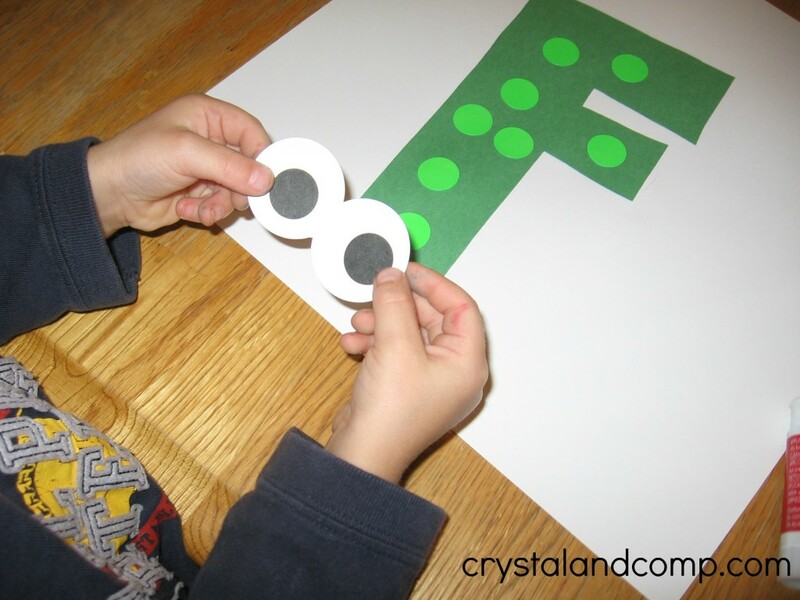 We like to use dot stickers because I have a giant set left from my teaching days. 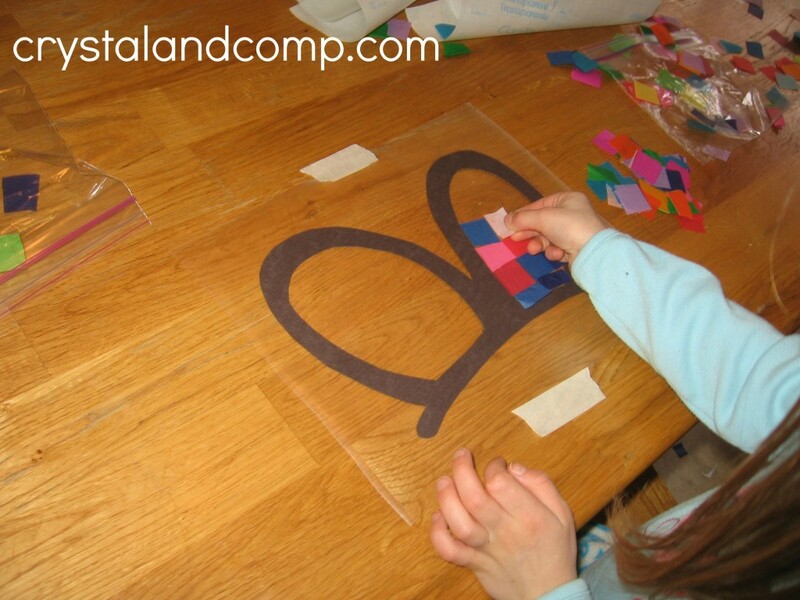 Kids love stickers, and it’s great fine motor practice to manipulate the small pieces. I gave the older kids yellow dot stickers because I thought the black stickers would not show up against the road. My two-year-old used black, and I think it’s a better choice. 5. If you have white hole reinforcements, put them down in the center of the tires. 6. Finally, draw letter C’s behind each car for the smoke. My four-year-old really got into this – as you can see! He said that the orange car was going faster, so it had a lot more smoke. And here are the finished projects! My two year old is not really drawing letters by himself yet, but you can see that he wrote according to his ability. 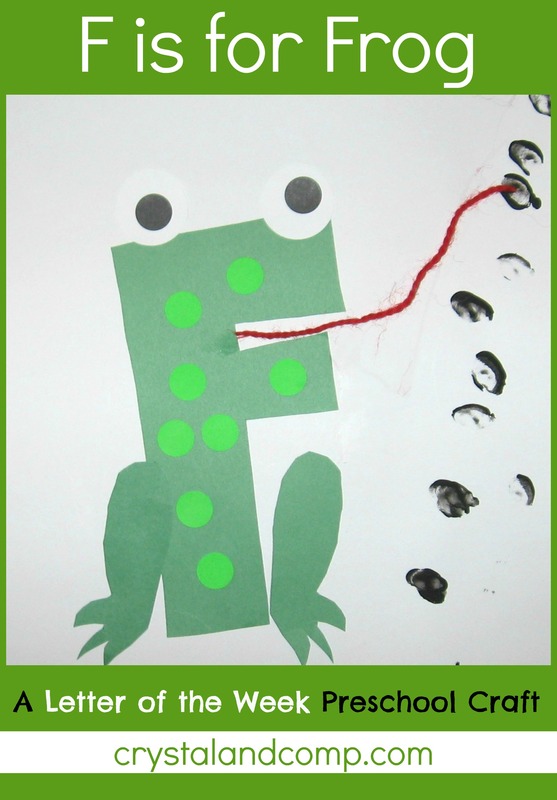 You can prepare toddlers and preschoolers for writing by having them write with their finger. 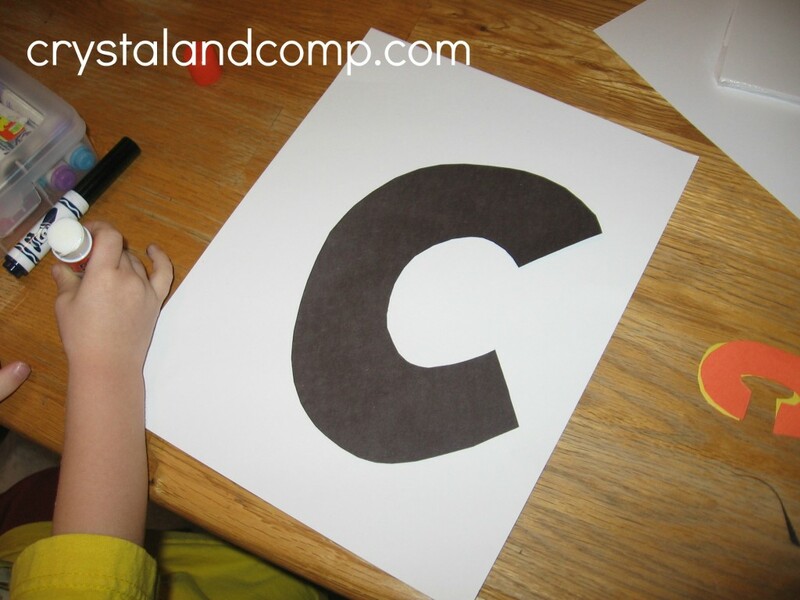 For the letter C, put cornmeal on a baking sheet and show your child how to write a C with his index finger. Gently shake the tray to start over. Up so high, up so high. And then she fell asleep. She dreamed that she could fly. 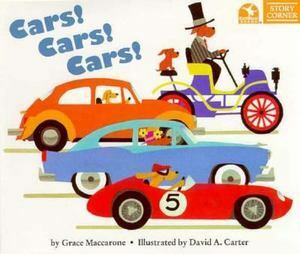 This is the perfect book about cars for young listeners. 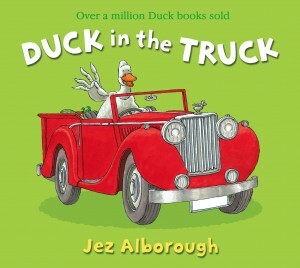 With the funny dog drivers and short, rhyming text, it’s a quick and fun read. A bonus is that it’s one you won’t mind reading over and over! 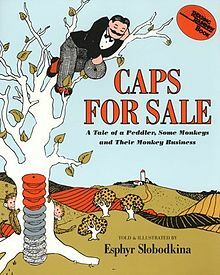 This classic story (from 1938) is about a cap salesman who runs into trouble when monkeys steal all of his hats. How will he get them back? 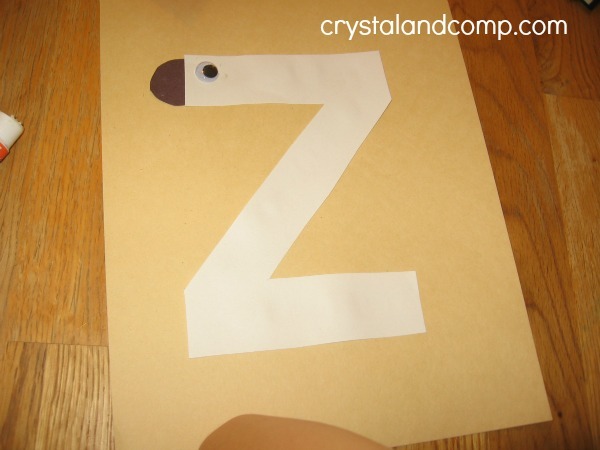 This is a wonderfully funny story to act out with your preschooler. Some books will never lose their appeal, and this is one of them. 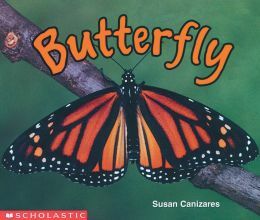 It teaches the days of the week, counting, and the life cycle of a butterfly (though not exactly scientifically correct) — with beautiful illustrations and a great story. 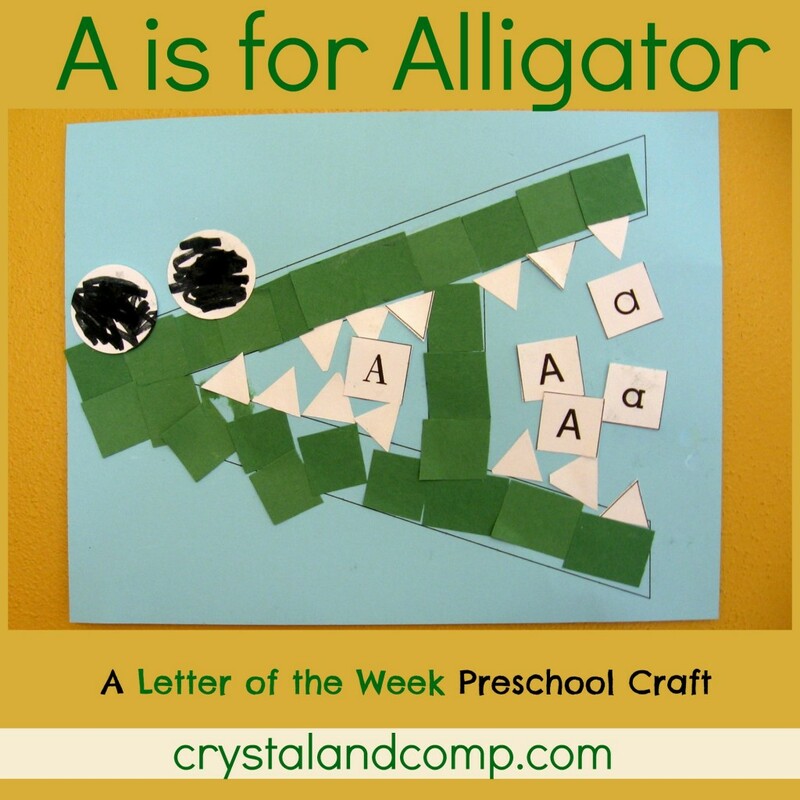 We love letter of the week crafts at our house when our preschoolers are learning their alphabet. 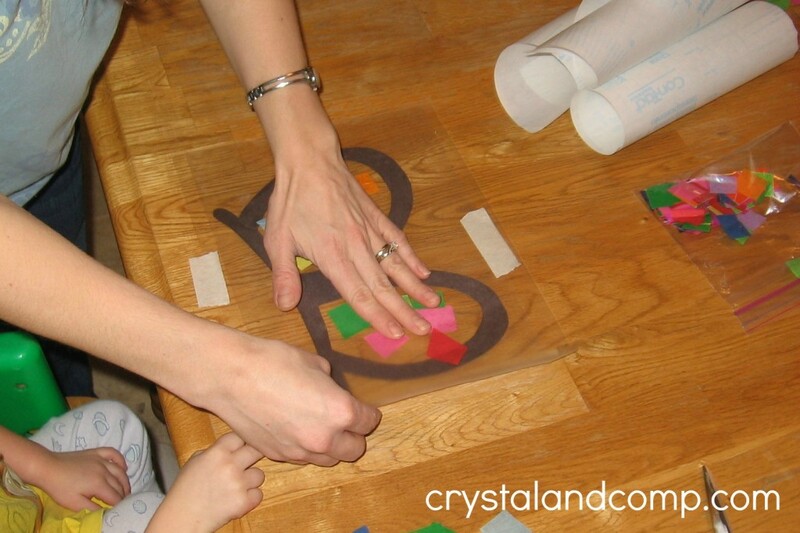 We love doing contact and tissue paper crafts at our house. They’re simple, but beautiful — and they adorn our windows for months! 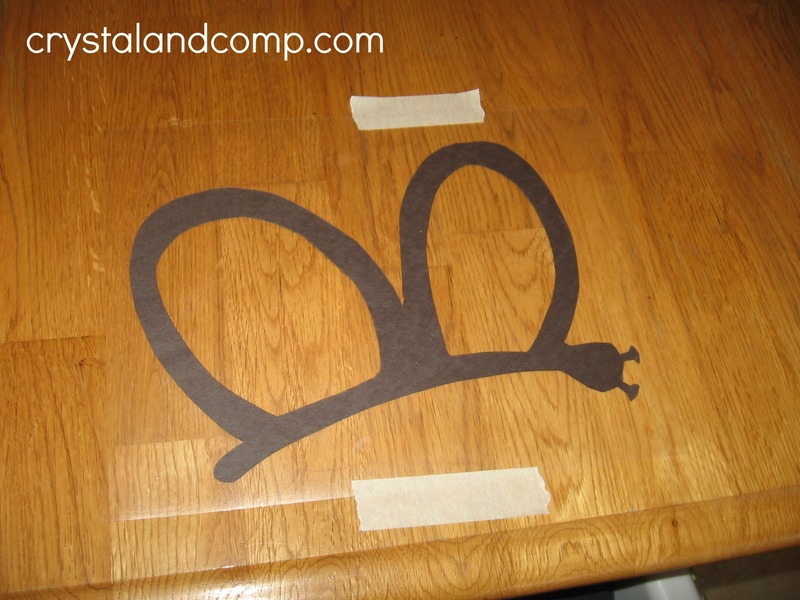 two pieces of clear contact paper (about 9×12 inches each) — I strongly recommend Con-Tact brand. A good place to find it is online, in the shelf liner section of Walmart or Target, or in the back of Michaels. If you don’t already have a roll, don’t be afraid to buy it just to do this craft. You’ll find lots of uses for it! 1. Peel off the backing of one piece of contact paper. 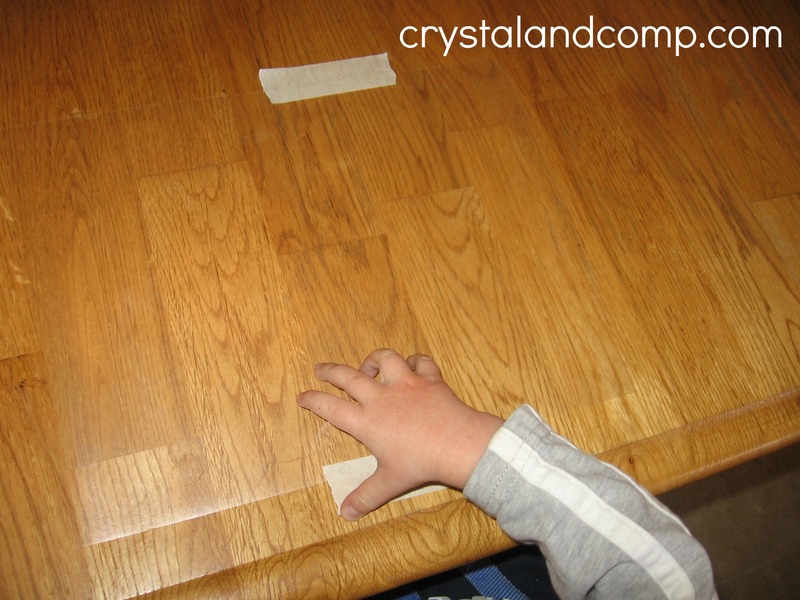 Secure it to the table with masking tape, sticky side up. 2. 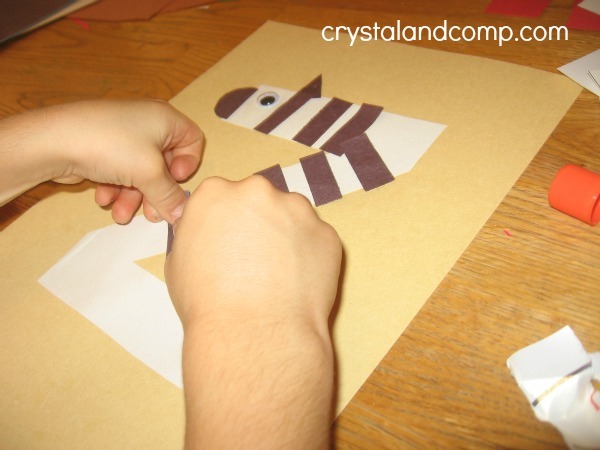 Lay your butterfly onto the sticky contact paper. Make sure its head is facing to the right. 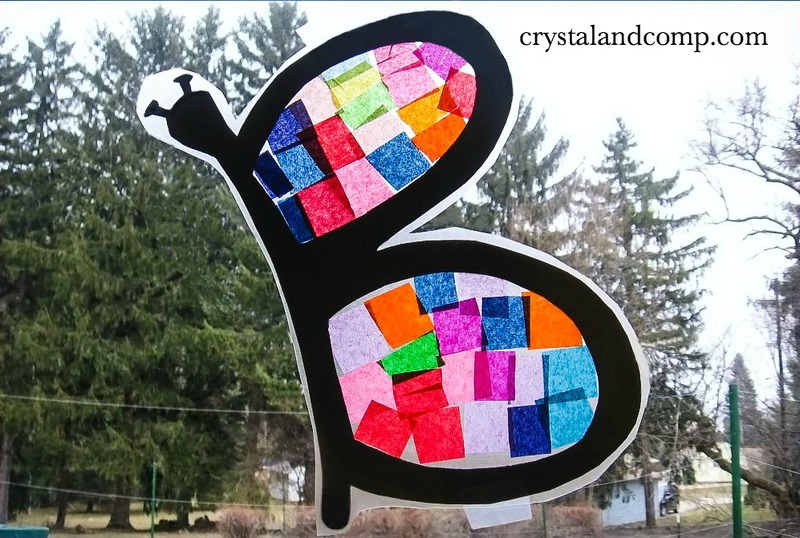 This is so that when you display the butterfly, the “B” will not be backward. 3. 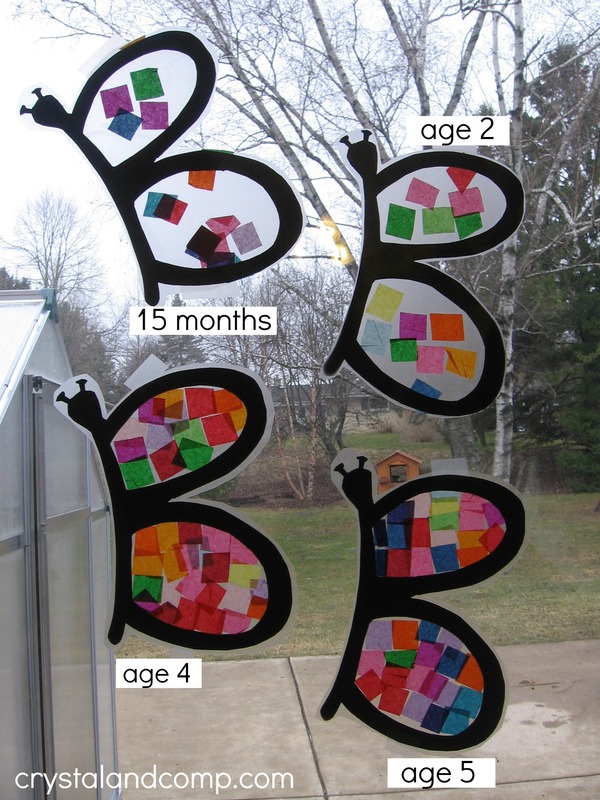 Now your child can apply the colored tissue paper squares however he wants. No problem if the tissue paper covers part of the black construction paper. This will be the back of the craft. 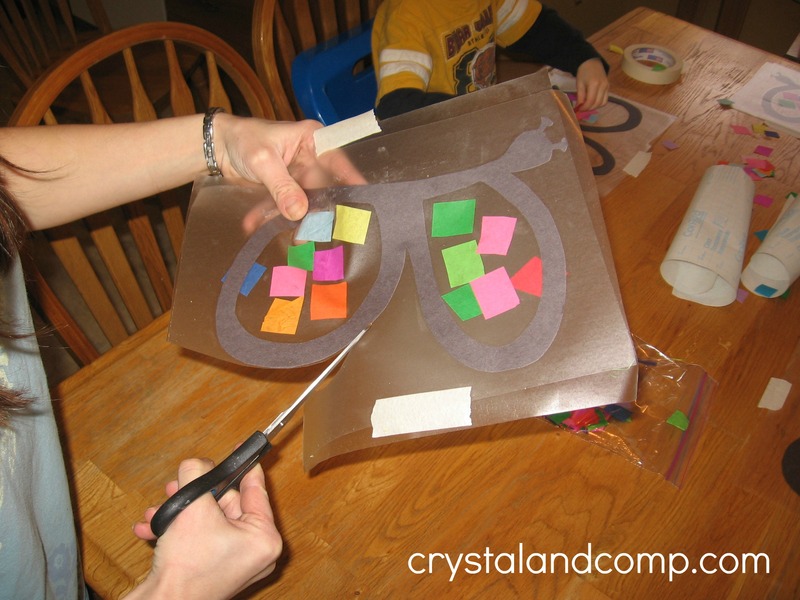 Encourage older children to cover all the sticky inside of the butterfly. You can see that I strapped my 15-month old into his high chair so that he could make a butterfly. This is one of the first crafts he’s been able to do with the big kids. 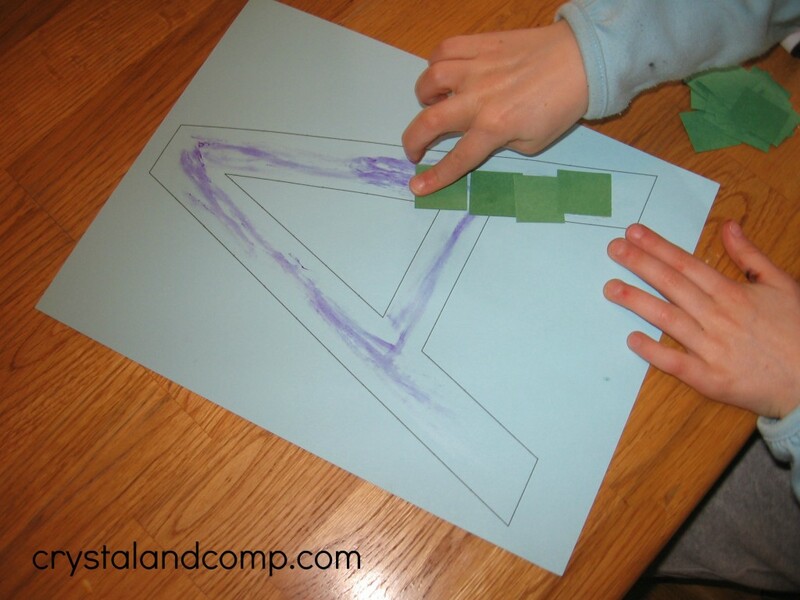 He was very careful about placing the tissue paper squares onto the sticky paper. He loved it! Of course, he’s just a little guy, so his attention span lasted for about two minutes. 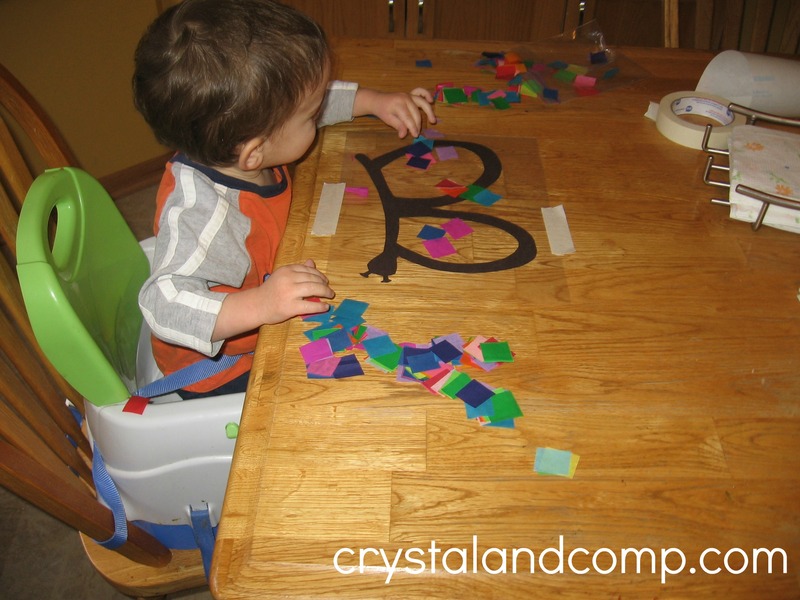 No problem — this was fun for him, gave him some fine motor practice, and made him very happy to be included. 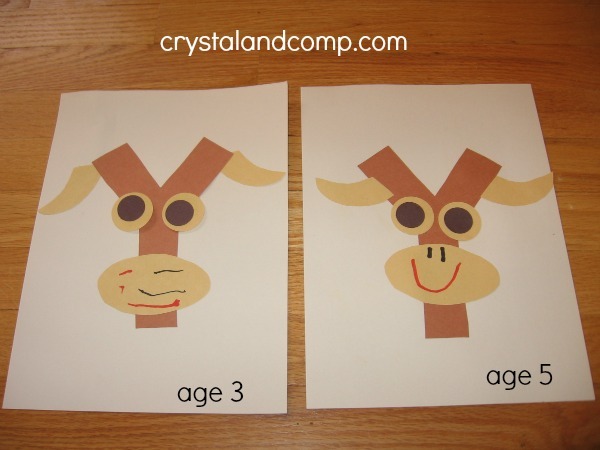 You can see how this craft is great for kids of different ages. My Five loved to carefully lay her tissue paper in neat rows. 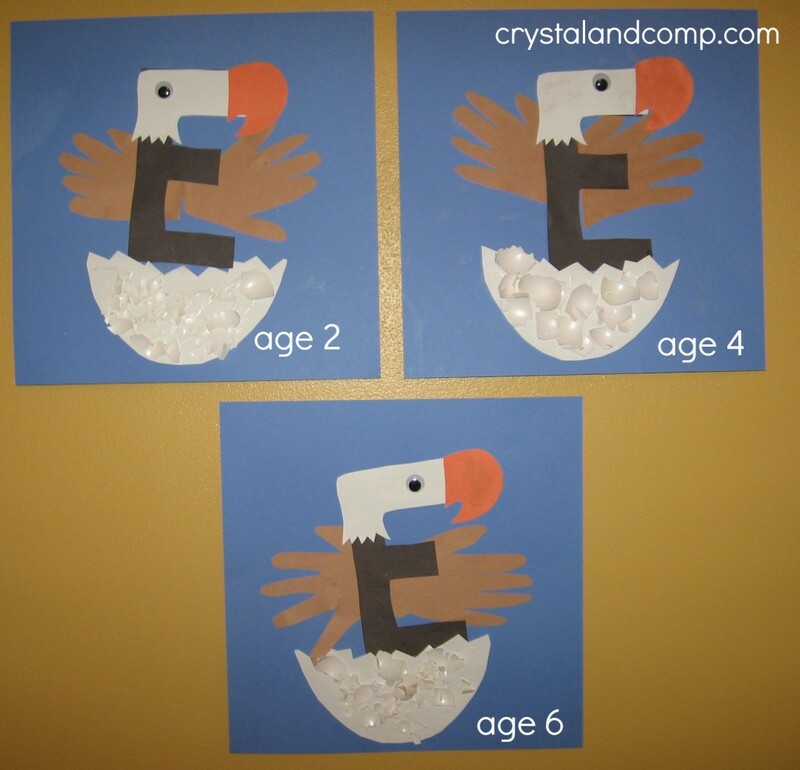 I have done this sort of craft with children up to third grade, and they loved it too. 4. 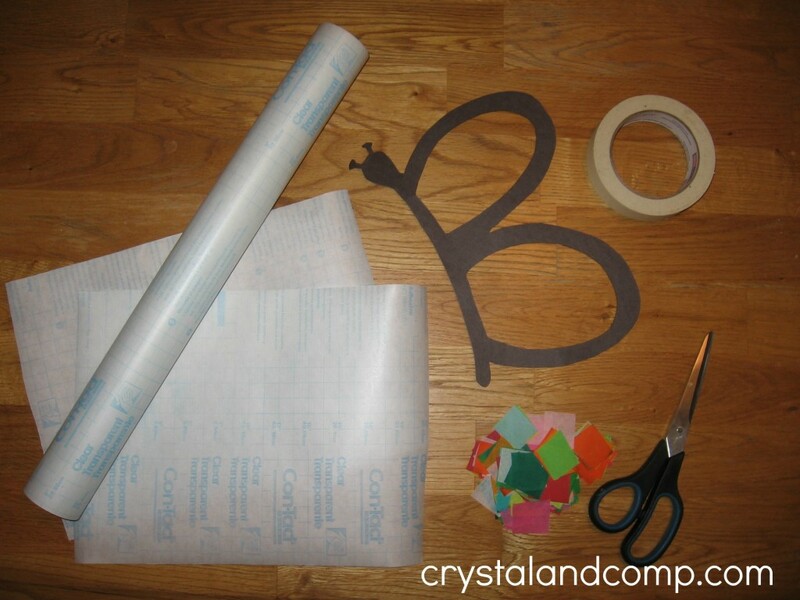 Cover the finished butterfly with the other piece of clear contact paper. 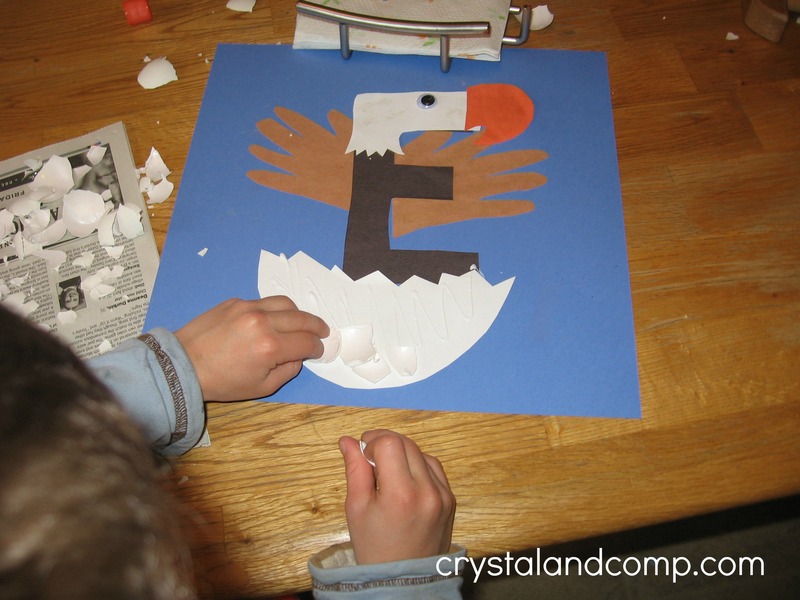 Carefully set it on top, and rub your fingers over the paper to seal the craft together. 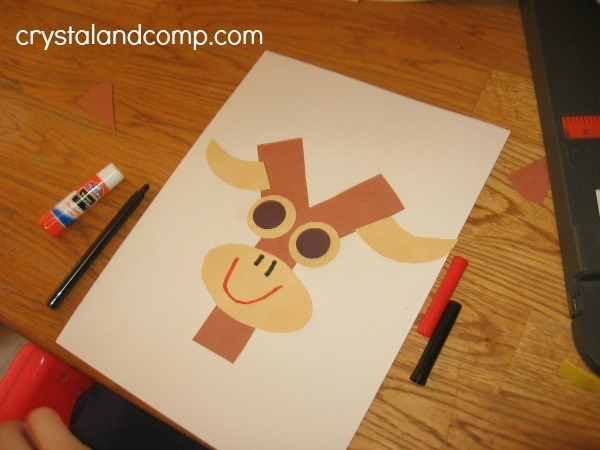 I was nervous the first time I did this sort of craft with the kids, but it’s actually very hard to mess up. 5. Trim around the outside edge of the craft with a scissors. You should leave at least half an inch around the outside. As you can see, I cut a lot closer, and the projects did not stay well-sealed. Aren’t they beautiful? If today were a sunny day you’d see how lovely they look in the window. 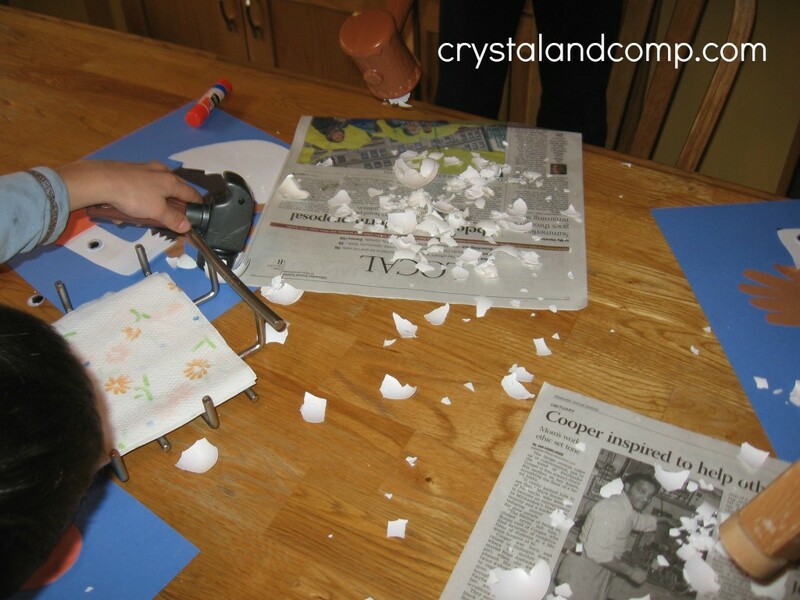 However, we actually had snow flurries when we we were doing this craft. Yes, in mid-April. But where are the bees? Hiding inside, where no one can see. Here they come, out of the hive. Did you know that one of the best predictors for kindergarten teachers about their students’ success is if they come to school knowing nursery rhymes? 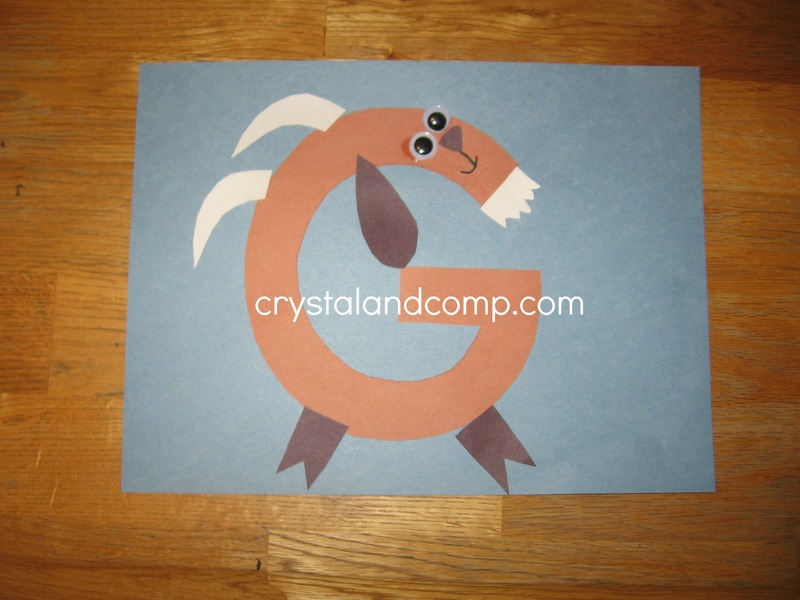 If you haven’t started teaching your preschooler nursery rhymes, it’s not too late! And one for the dame. I’m a huge fan of these science emergent readers. 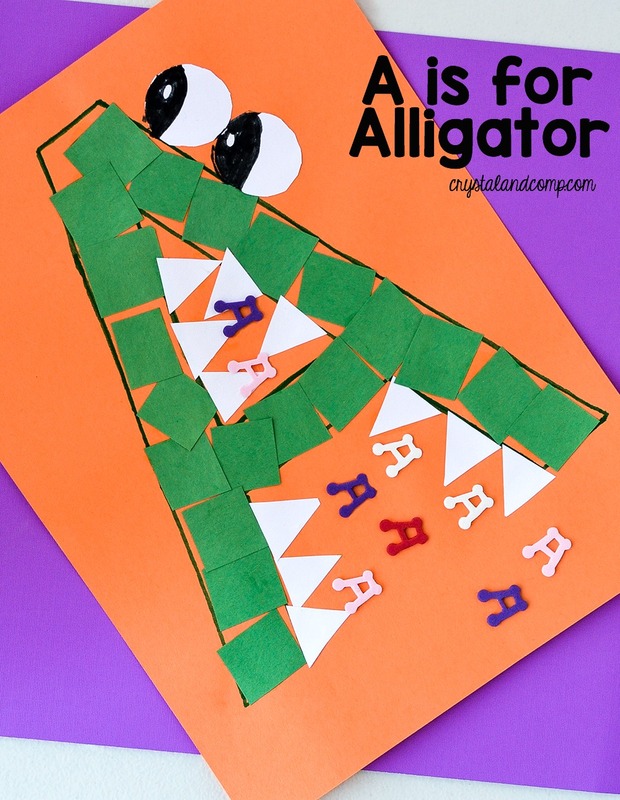 They have big pictures and a little bit of text — just right for toddlers with short attention spans, but fun enough for preschoolers. 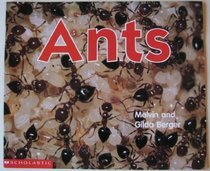 They’re also great first nonfiction books for kids learning to read. Check out Susan Canizares’ books on Amazon – you really can’t go wrong! The fun animal sounds and never-ending rhymes make this a fun book and an important one for learning, too. It can be tiresome to read your child the same book over and over, but it’s so important — especially when listening to the book a hundred times helps your child learn to rhyme. This book, published in 1948, is still a favorite. 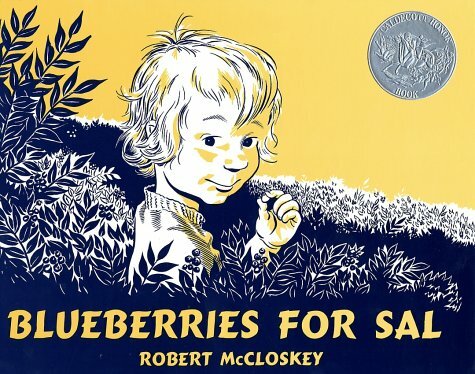 Little Sal and her mother are picking berries on Blueberry Hill. On the other side of the hill are Little Bear and his mother. Somehow the little ones get mixed up and end up following the wrong mother. All is resolved at the end of this engaging story. 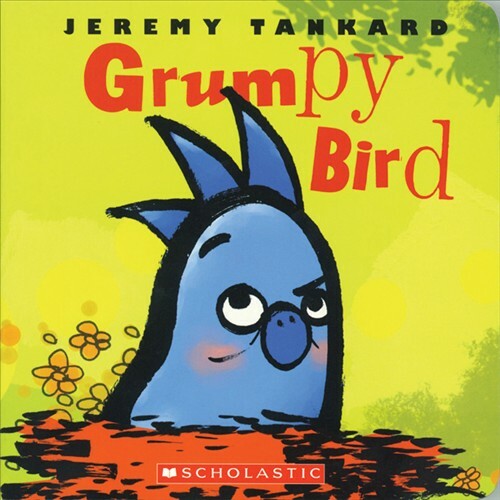 Here’s a newer book (2007) about a grumpy bird whose animal friends help to pull him out of a bad mood through exercise and a little companionship. We always giggle when we read this one! 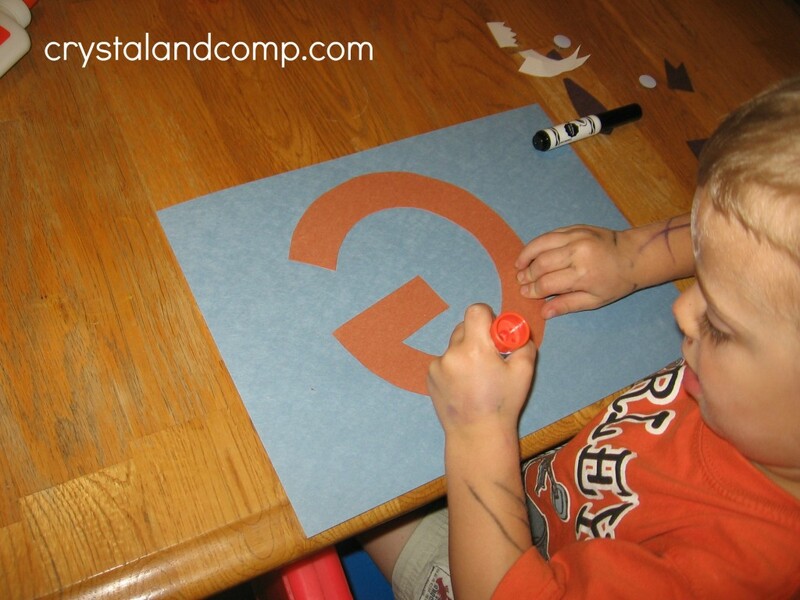 Want to do preschool at home with your little one? 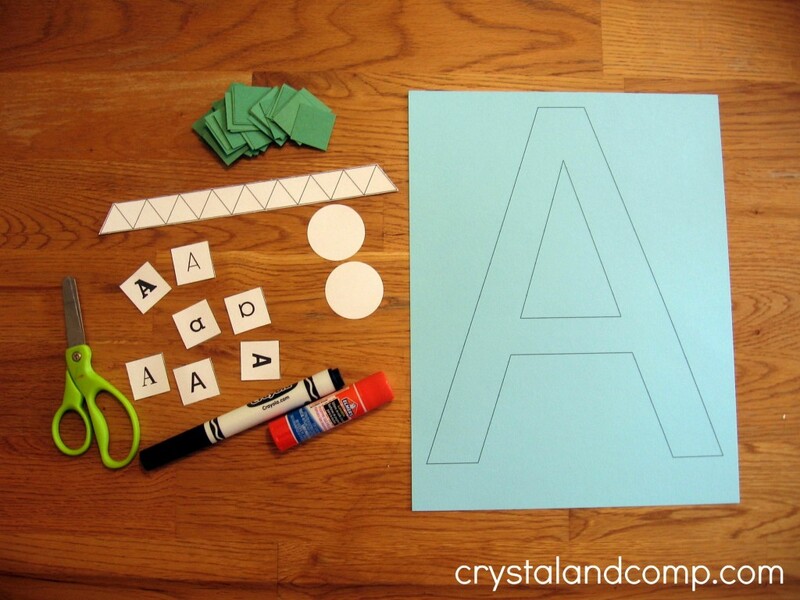 Grab our complete Alphabet Preschool Curriculum, which is an instant download. 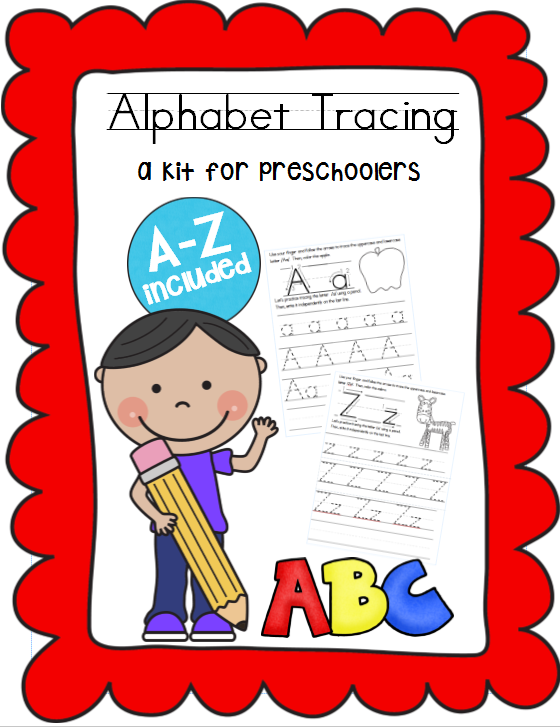 In this pack you get 104 activities with printables, templates and instructions for making a craft, hand print art, snack, uppercase and lowercase tracing pages and do a dot pages for each letter of the alphabet. 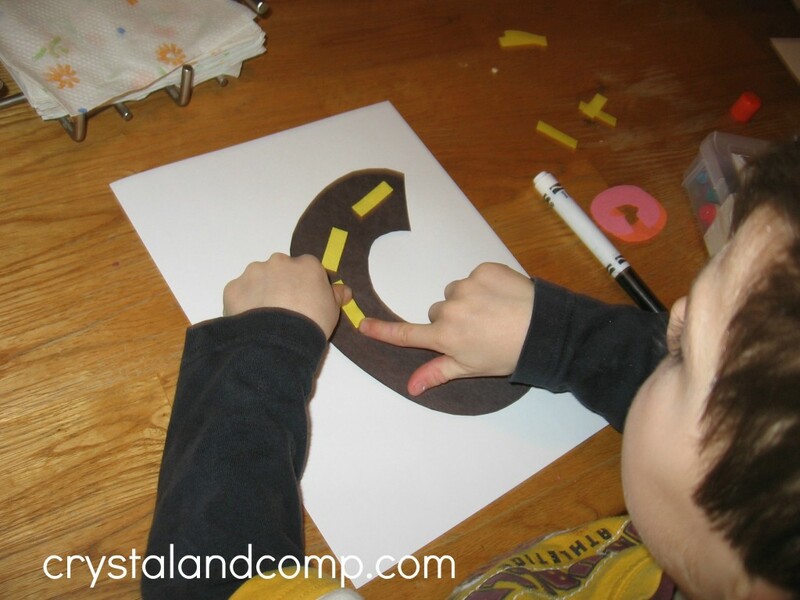 Letter j activities for preschoolers is a popular topic that readers search my site for. Crazy, right? 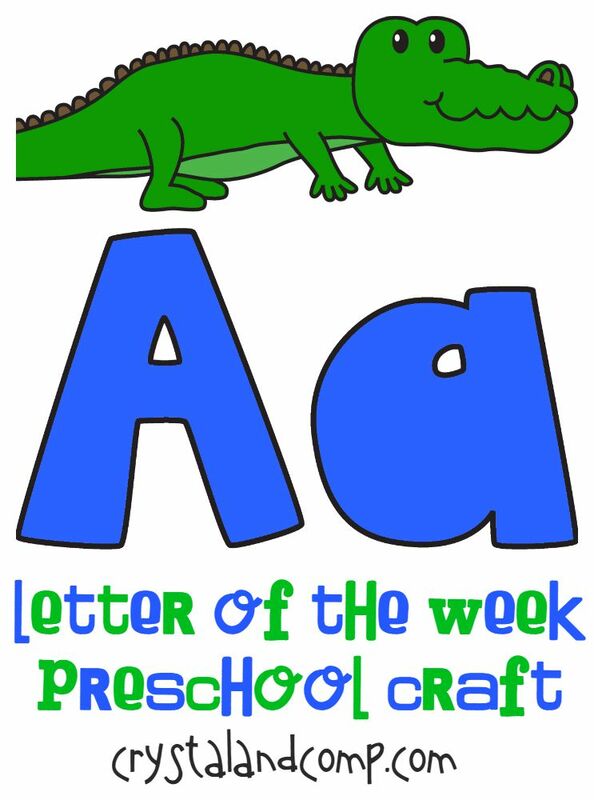 As you know I have letter of the week crafts that I share on my site, as well as snacks and do a dot printables for preschoolers. 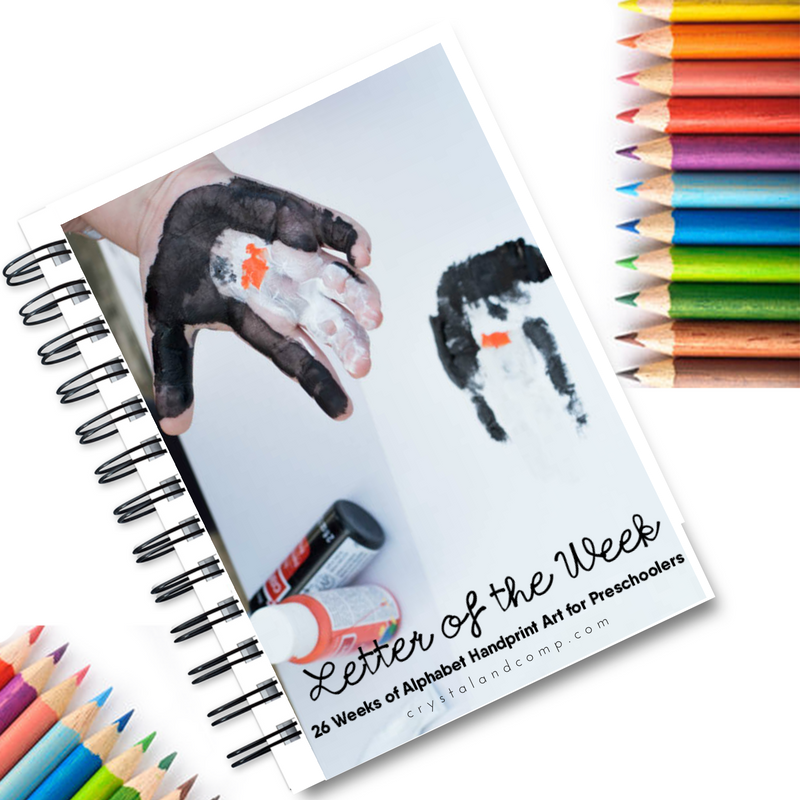 I pulled all of the letter j activities and crafts from my site and I reached out to some of my other friends who write about letter of the week activities. 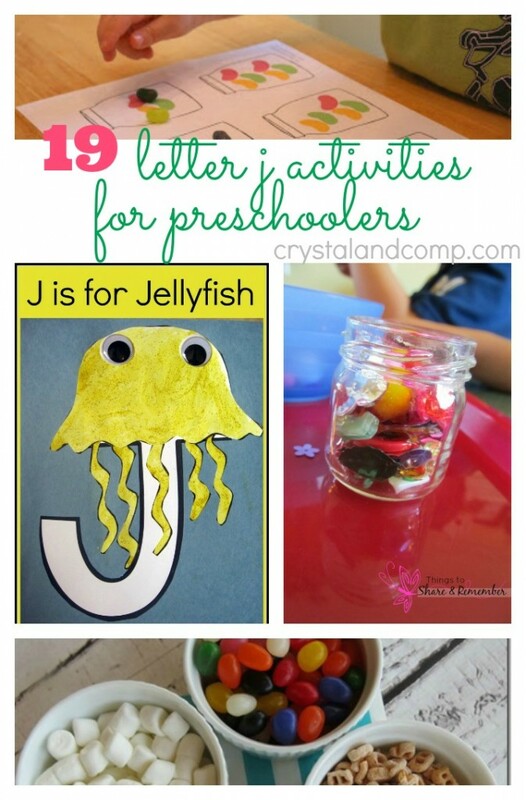 Here are 19 fun things you can do with your toddler, preschooler and early learner as you explore the letter Jj. 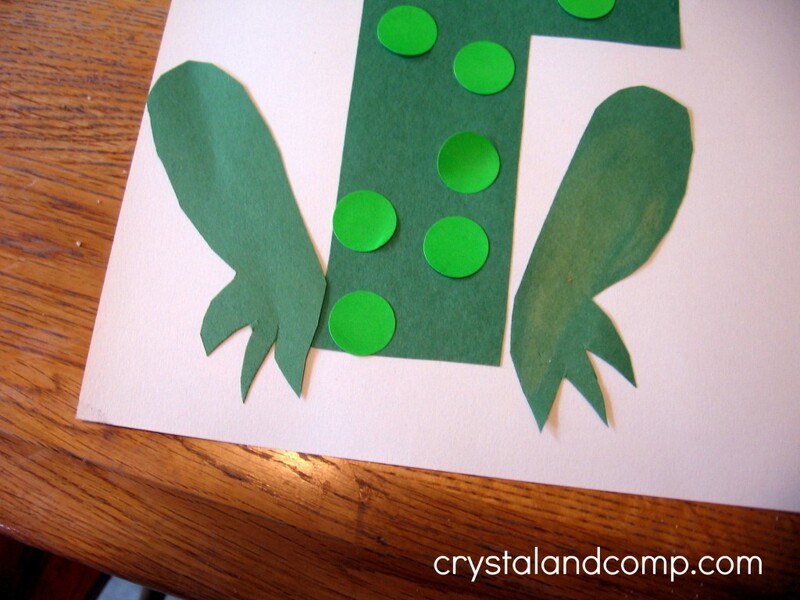 J is for Jellyfish Craft– a jelly fish printable craft for your preschooler while you learn the letter J.
Jelly Bean Science– sorting and classifying. 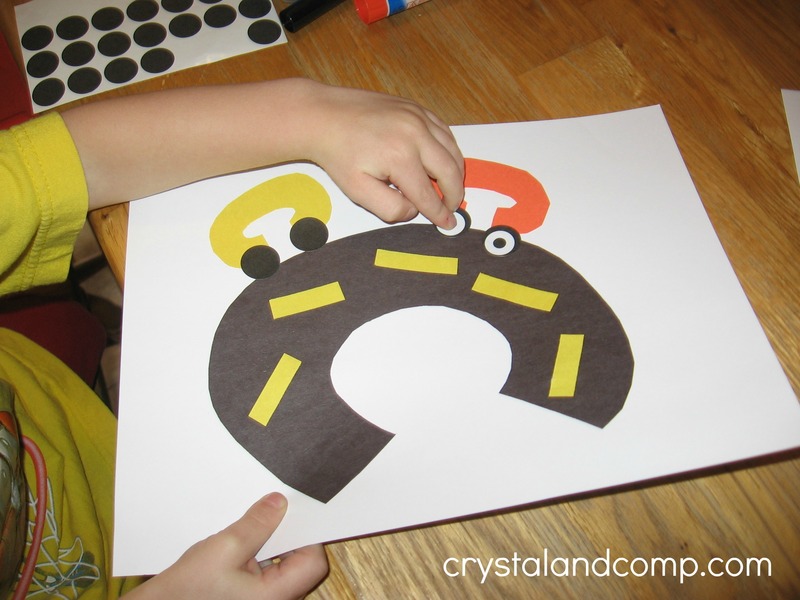 Making Jingle Sticks and Jingle Rings– a jingle toy for creative play. Jellyfish Craft– a fun craft that focuses on an underwater party theme and lets kids decorate their own jellyfish. 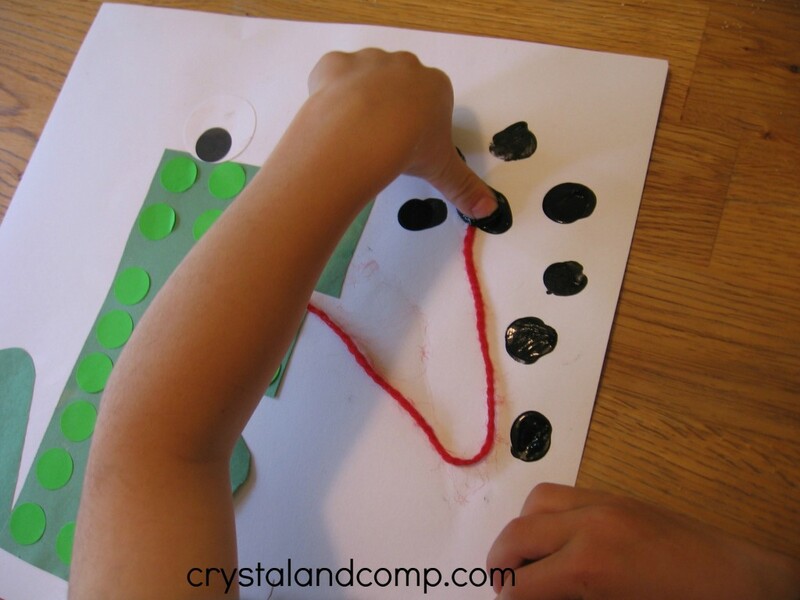 Jelly Bean Painting– do you know what happens when jelly beans get wet? Who knew you could paint with them? Juggling– make homemade juggling balls made from balloons. 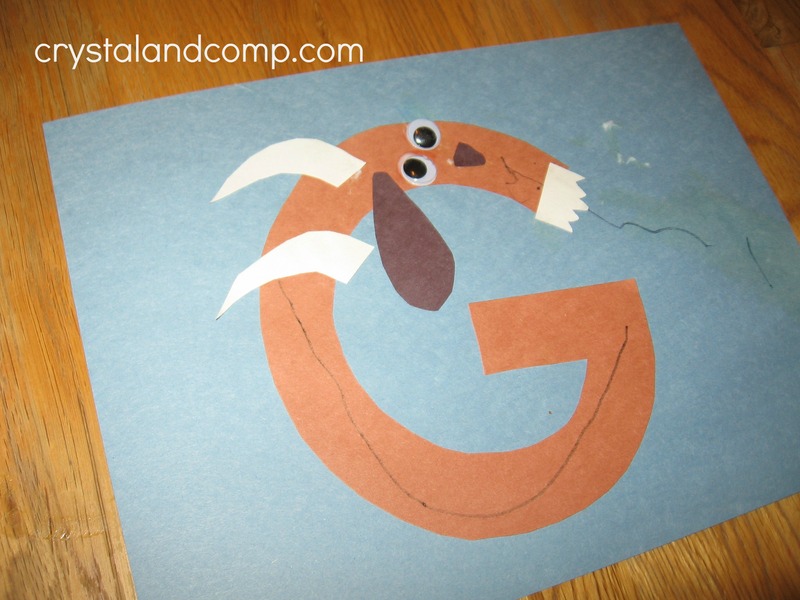 Meet Jack – a week of fun with the letter J and Jack. Jelly Bean Bracelets-great fine motor skill activity. 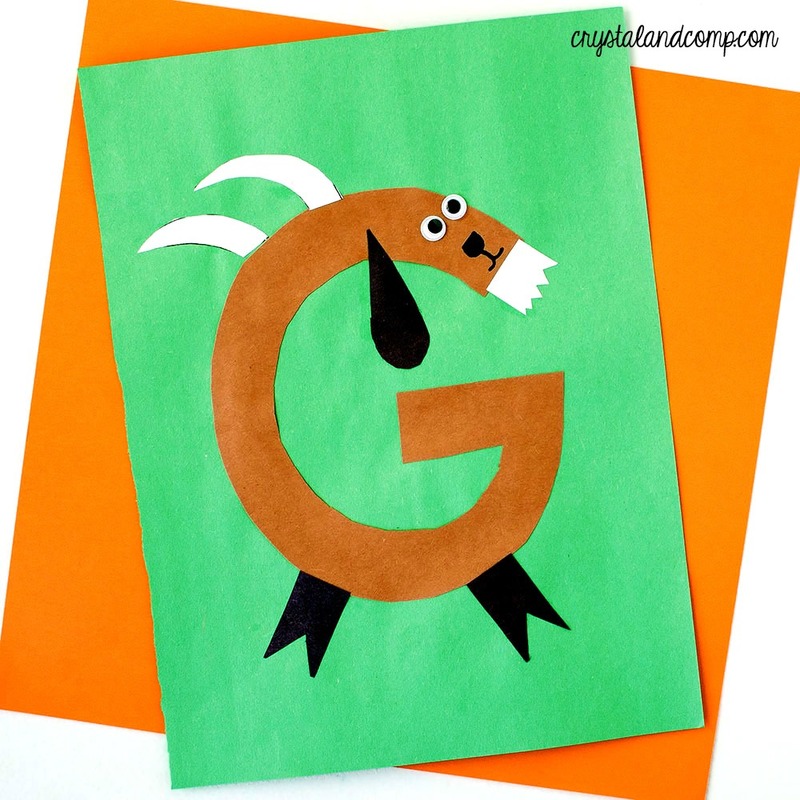 Reading the Alphabet: Letter J– a collection of printables to use when you study J. 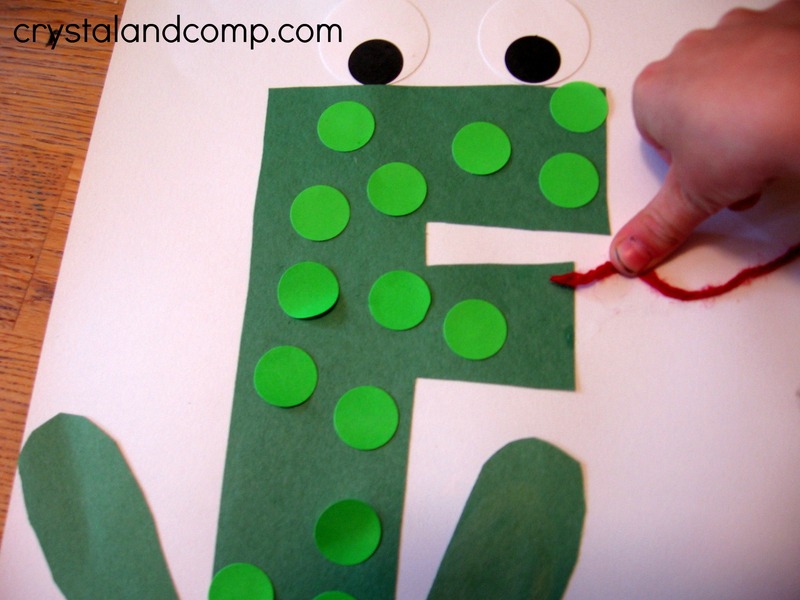 Do a Dot Printable– use do a dot markers as you find the big J’s and little j’s like in jelly fish. 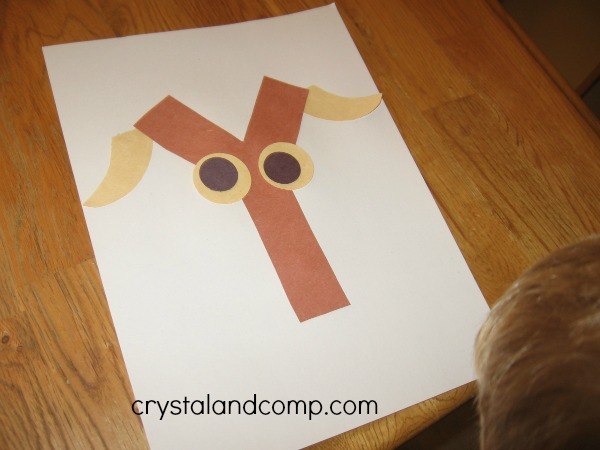 J is for Jesus Printables – a collection of J is for Jesus printables. Fun packet! Romping and Roaring J Printables Pack– a collection of color sheets, mazes, printables and more all about J. 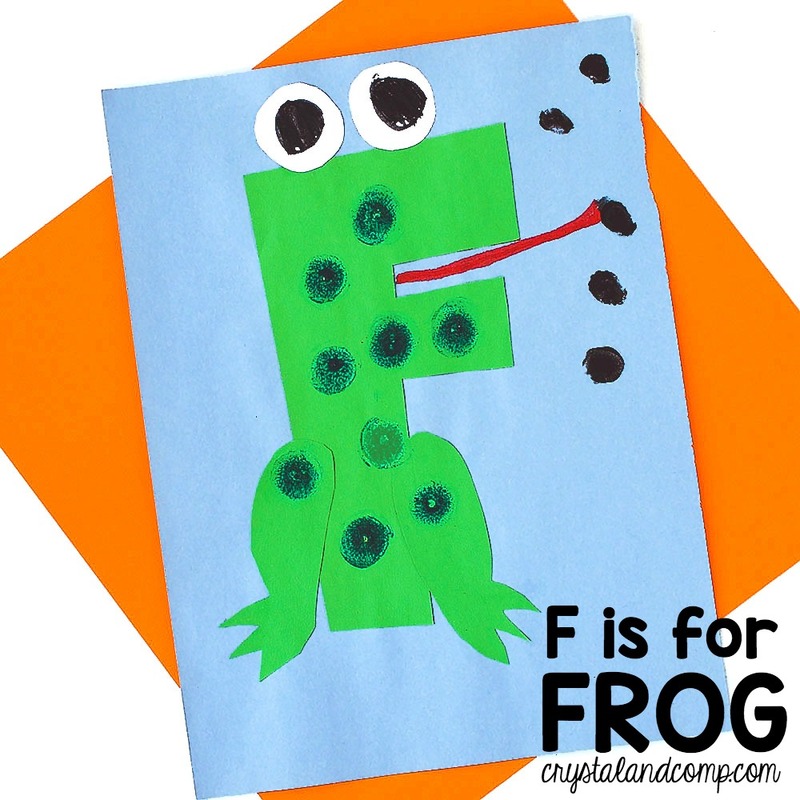 Letter J Crafts and Printables– a collection of J printables that are perfect for tot school. Creative ideas. 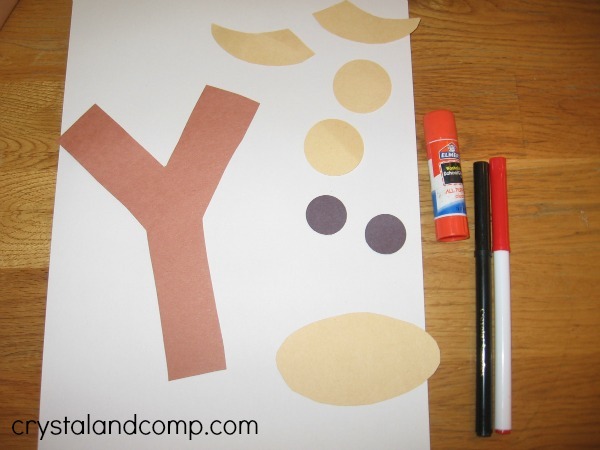 J is for Junk Jar– make a junk jar as you learn about J.
Olympic High Jump Kids Activity– a great physical activity to incorporate in learning. 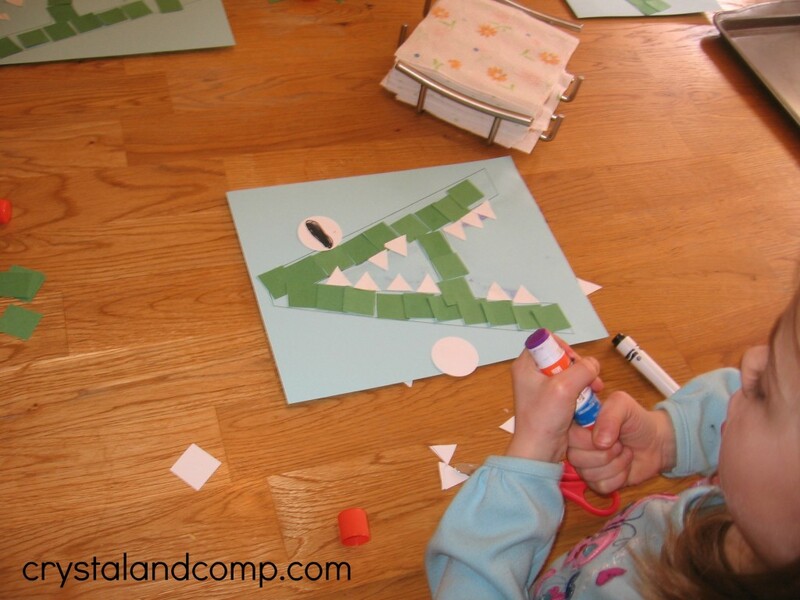 Jack and the Beanstalk Reading Activities– fun activities that focus on this popular story. 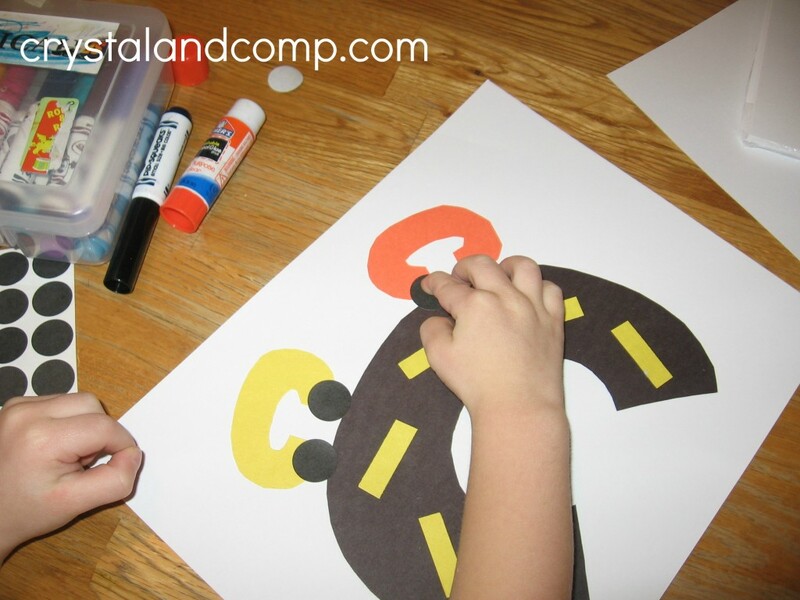 Alphabet Kids Activity JKL– simple letter crafts for J,K and L.
Jelly Bean Trail Mix– a simple snack your kids can help you make as you learn the letter J.
Painting with Jars– a very creative idea! Which one are you most excited to share with your preschooler? 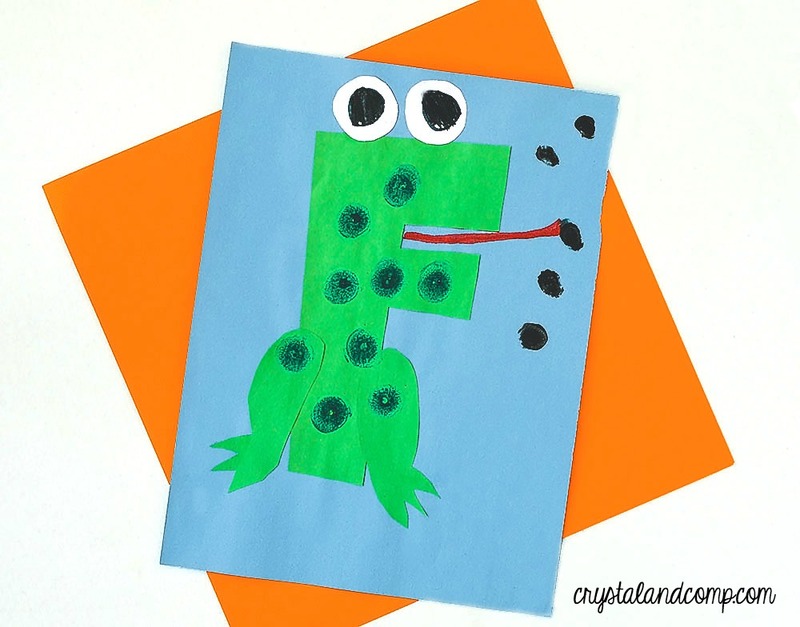 I’m Anna from The Measured Mom, and it’s been so fun sharing letter of the week crafts and learning ideas with you at Crystal & Company! This is our final week in the series. 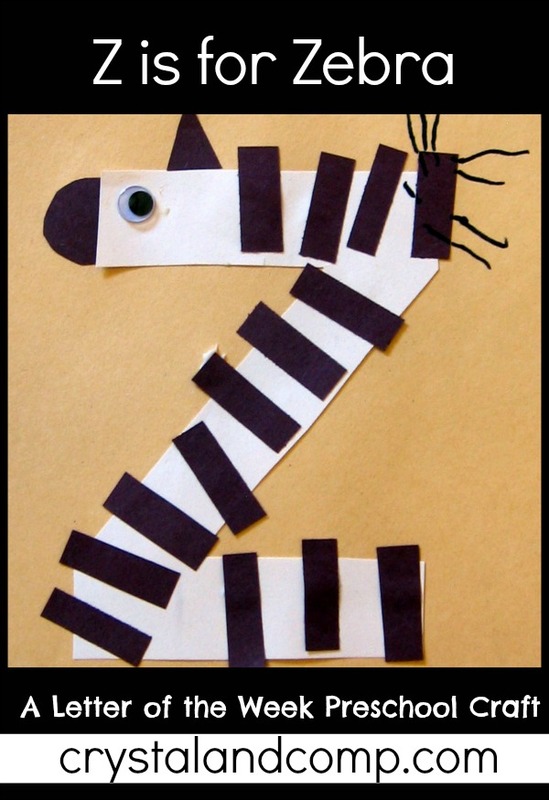 We’re wrapping it up with letter Z — for zebra, of course! 1. 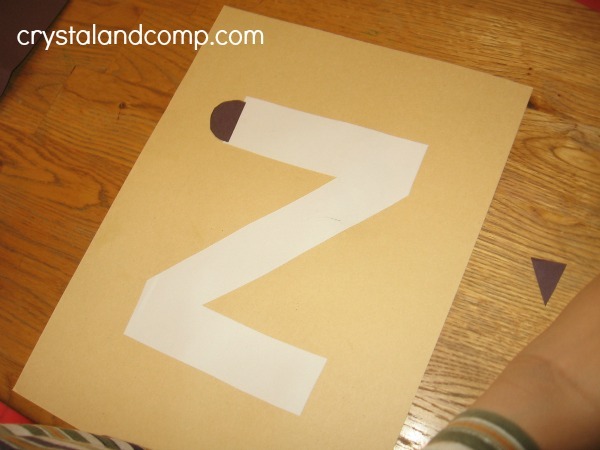 Glue down the Z in the center of the paper. Add the black nose. 2. Add the googly eye. 3. 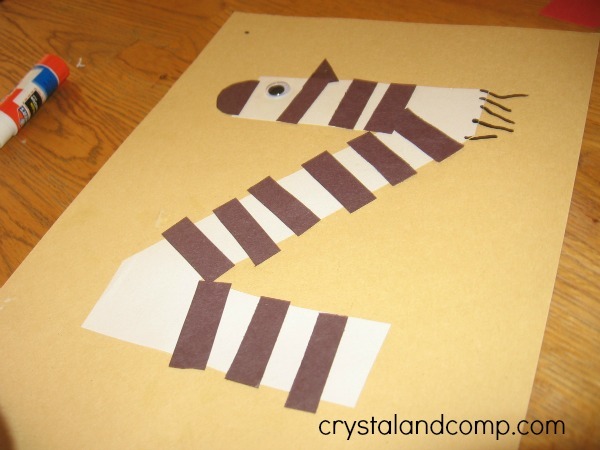 Give your zebra a triangular ear. 5. Use a black marker to add the zebra’s mane. Say this rhyme in a sing-song chant. Be sure to say that last line with a shout! We’ll be there very soon. Just step inside my rocket ship. 4 – 3 – 2 – 1 – BLAST OFF! Who works down at the zoo? 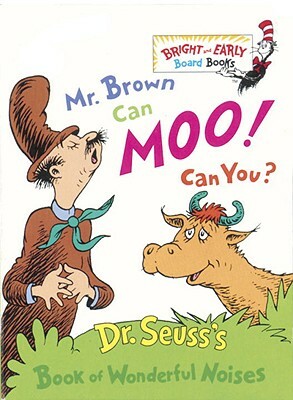 I couldn’t leave out this classic rhyming tale by Dr. Seuss. 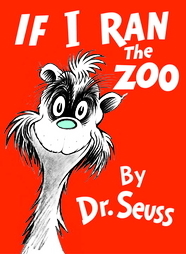 Kids will enjoy this zany story about a little boy named Gerald McGrew – and all the changes he’d make to the zoo. I just fell in love with this beautiful story about a kind old zookeeper named Amos. He takes time for each of the animals – and he is their dear friend. 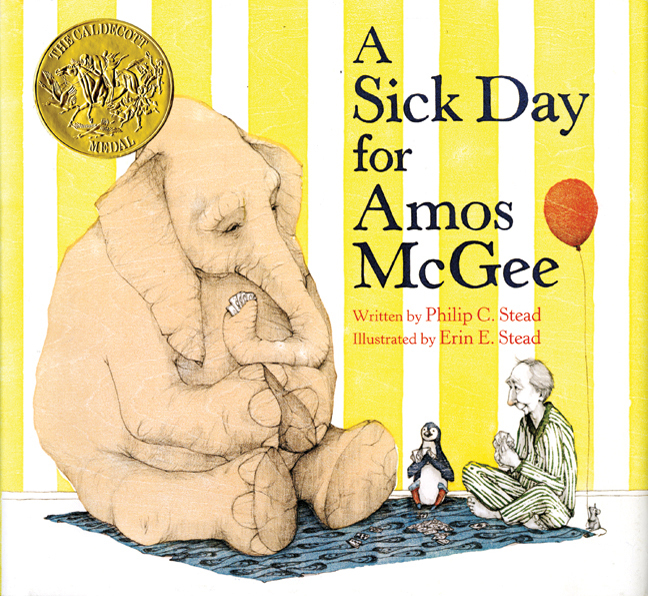 But one day Amos is sick and can’t be at the zoo. So the animals come to him! The award-winning illustrations will steal your heart! Anna taught eight years and received her MEd in Curriculum & Instruction with a focus on literacy. In 2007 she began her career as a stay-at-home mom. She has four children – a girl (6) and three boys (5,3,1). She enjoys teaching them at home and after her daughter’s day at school. Anna blogs at www.themeasuredmom.com. 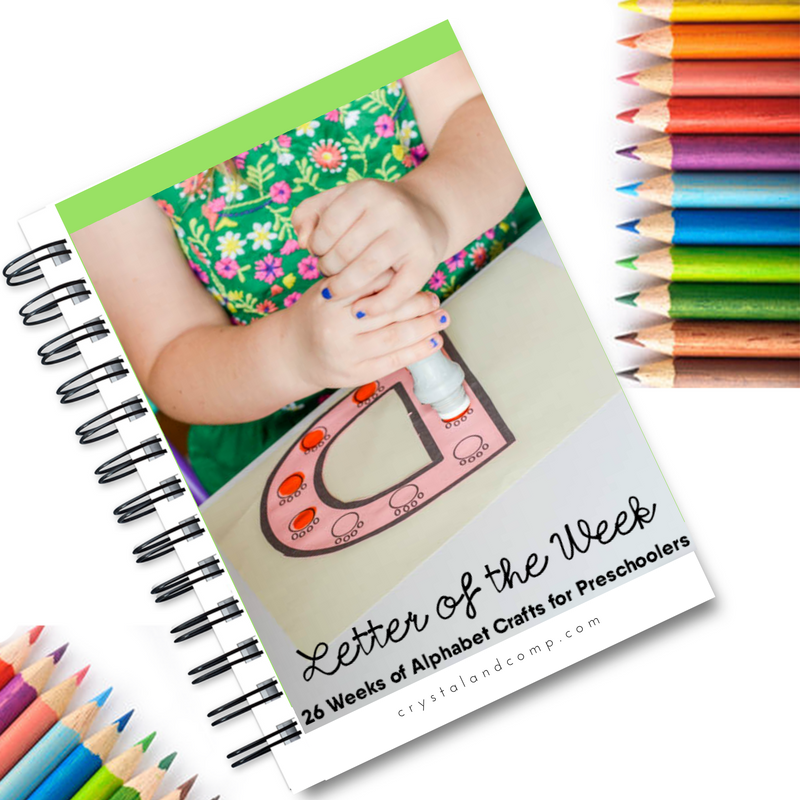 I’m Anna from The Measured Mom — and I can hardly believe it, but my preschoolers and I are almost done sharing weekly letter of the week crafts with you at Crystal & Company! 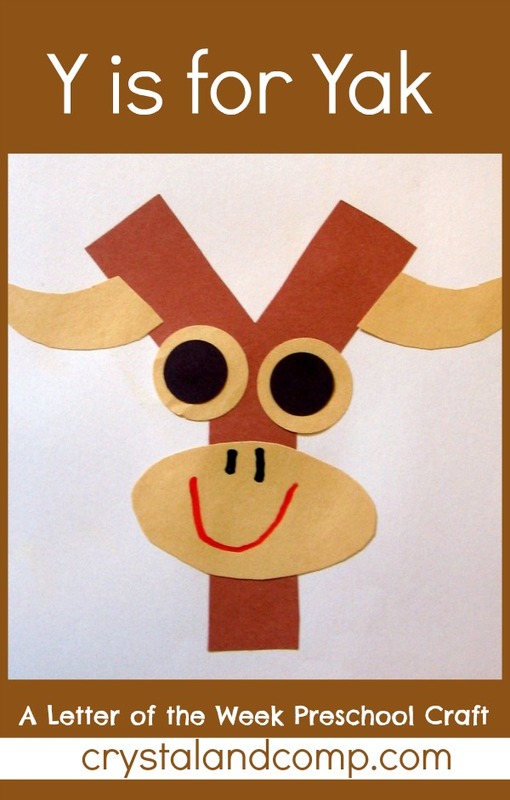 This week we found an adorable craft over at Pinterest: Y is for Yak. Be sure to read to the end for rhymes and books to go with the letter Y.
I like the credit the sources of my crafts when they’re not original, but I couldn’t track down the creator of this one. 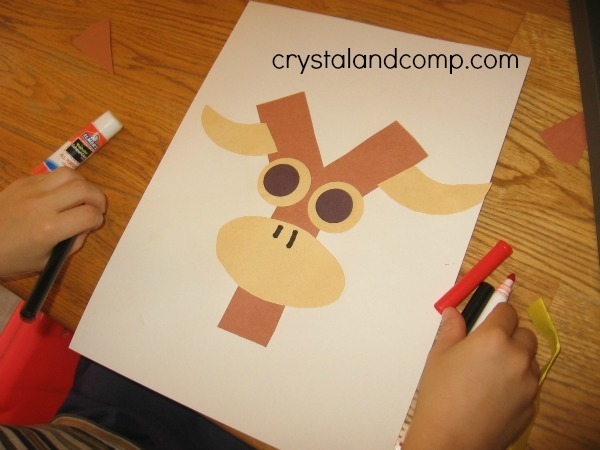 We loved it – and my boys had a lot of questions about yaks as we completed the craft! 1. 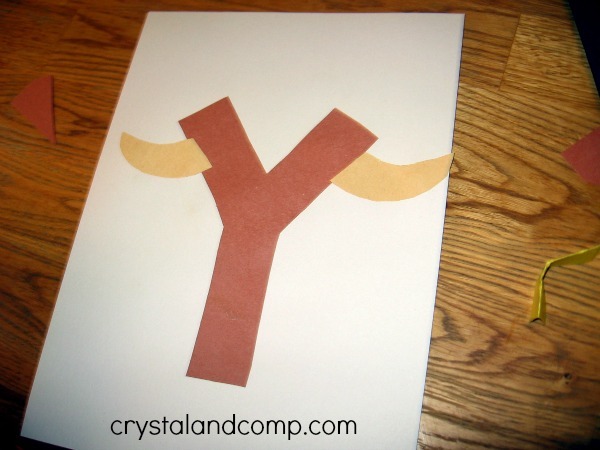 Glue down the Y in the center of the white paper. Add the horns on either side. 2. Make the eyes by gluing down the large tan circles first. Then add the small black circles on top. 3. A little farther down, glue down the oval for the nose and mouth. 4. Use the black marker to make two lines for the nostrils. 5. Add a big red smile! Most of us love this silly favorite! Just to ride a pony. 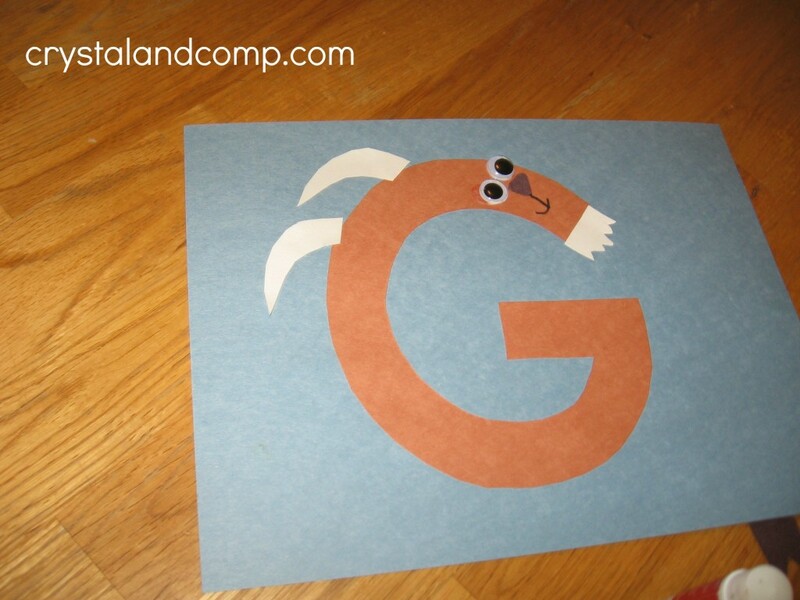 I know I’m stretching it here, but the letter “Y” is a seriously hard letter to find in children’s songs! You put your whole self out. This simple story of just 34 words is a unique story of friendship. When two boys meet on the road, one timidly offers friendship. 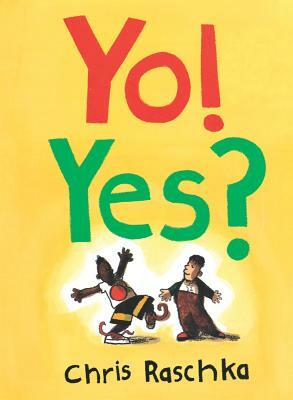 (“Yo!”) As they continue to talk in one or two words a piece, the boys excitedly agree to be friends – sealed with a “Yow!” This is a great story about friendship — filled with letter Y words! This book won a Caldecott Honor Award (honorable mention for best pictures). 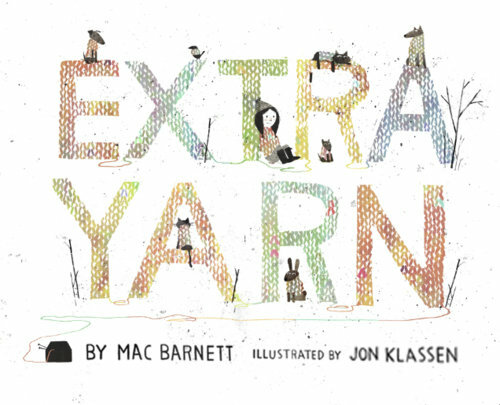 It’s a gentle story about a girl in a dreary, black-and-white world who finds a box of colorful yarn. Her town is transformed as she covers its inhabitants with beautiful knitwear.